The opinions expressed on this page are those of the individual authors. I’m not saying anything about the conference here as that has been reported already. A few days before the scheduled end of the conference David and I started to emerge in moments from the intensity of the conference schedule, the meetings, the workshops and the nightly reflections, to think about the trip back. We already knew we were going home via Uganda and Rwanda and that we would try to get a permit to trek to the gorillas in Uganda, but what was our picture-statement going to be for the trip home and how long would we take to get home? From our conversations emerged a wish to meet the people in the villages we would be driving through, to visit for example a bicycle workshop in a village, trek to the gorillas or see the chimpanzees and, as an end goal, to spend three days in the Chobe/Moremi area of Botswana before returning home. 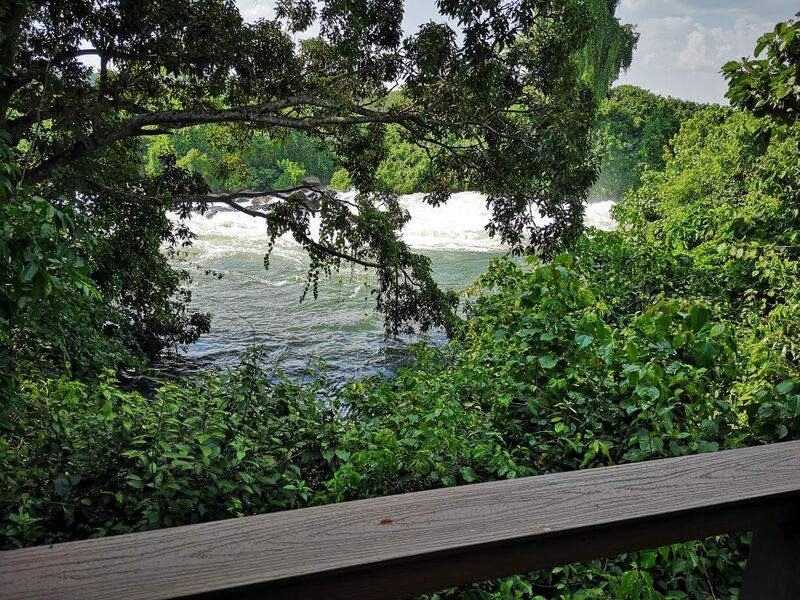 While planning our trip in Johannesburg, our friend from Drifters had recommended a stay at Wildwaters Lodge on the Nile River as it emerges from Lake Victoria near Jinja. We decided we would take Ken up on his offer and asked him to book us a night at Wildwaters. That would be our real ‘spoil yourself’ moment on the trip. We left Nairobi on the afternoon the conference ended with the intention of getting to Naivasha for the night, as the road to Jinja and Wildwaters Lodge in Uganda would be a long one the next day. We also wanted to avoid Nairobi’s morning traffic. Our departure was very smooth. We had stocked up on supplies in Nairobi, the Landcruiser had been serviced while we were in Nairobi, we knew now what to expect and were ready and excited to be back on the road. We drove down the high rift into the valley with Lake Naivasha in front and to the side of us around 3:30 in the afternoon. Thinking of Eileen Tippett growing up somewhere in the area and imagining the flying boats coming in to land on the water. It was also still earlyish in the afternoon so we decided to press on further and eventually arrived at the next lake in the Rift valley series, Lake Elementaita where we found a place to spend the night. 9th August – Lake Elementaita to Wildwaters Lodge, Kangulumira, Uganda via Busia Border Control. 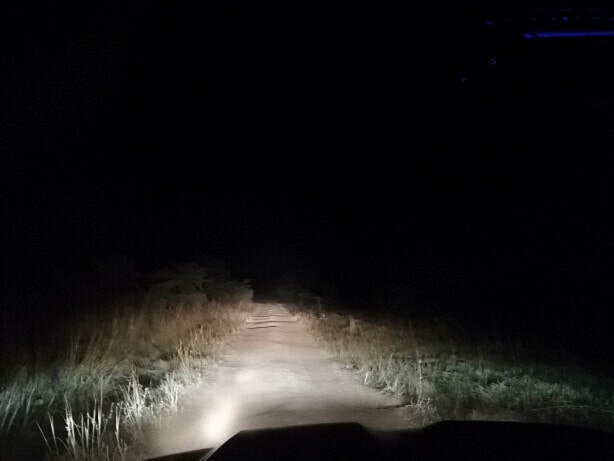 We left Lake Elementaita early the next morning, still in the dark, getting a bit lost trying to find our way along cattle tracks back to the main Nakuru road and nearly driving off a steep embankment. Our adventures had begun! After a few minutes of casting about and we found the entrance to the main road. By the time we were through Nakuru and on the road taking us back towards Lake Victoria it was daylight and we passed large tea plantations that proclaimed to be the suppliers of Lipton Tea. We crossed flat wetlands created by the many rivers flowing in and out of Lake Victoria, all cultivated by what looked like rice paddies but on subsequent reading may have been cassava plantations (edible starchy tuberous root crop). We passed many flowering mango trees and of course banana trees. Once past Nakuru the road was smooth tar and quiet for a very long way and we wound through the hills of the Rift valley. The border post was one of the more organised ones, what is called a one-stop border control as the authorities for the two countries sit next to each other and you literally move from one counter to the next to get all your paperwork stamped. 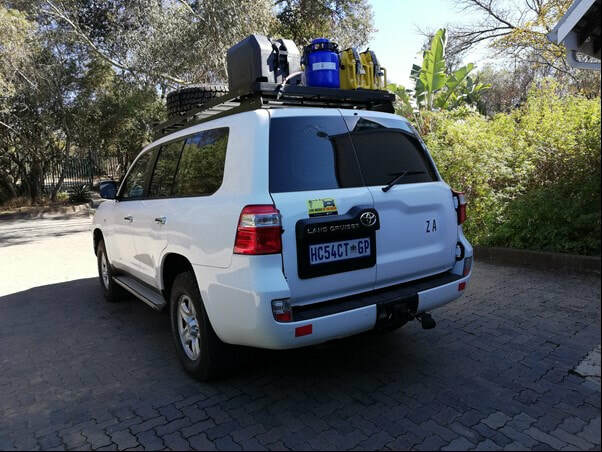 With the Carnet de Passage for the Landcruiser and a Comesa 3rd Party insurance certificate, the importing and exporting of the Landcruiser was a simple process, much less complicated than in the SADC countries. 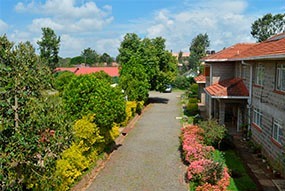 One noticed almost immediately that Uganda was much cleaner than Kenya and poorer, but not in the same way as Tanzania. The cultivation at this stage was very similar. In Jinja we passed a brand new highly modern suspension bridge in the process of being constructed. We found our way out of Jinja and up the Nile River to the landing stage for Wildwaters Lodge, our accommodation for the night. Here we had to leave the Landcruiser. We were paddled across the river to the island on which Wildwaters Lodge resides in the middle of the river with rapids flowing past on either side. I think we both had our best night’s sleep of the whole trip that night with the sound of the water rushing over the rapids drowning out any other sound including that of the field mouse that got into our snack bag and chewed through some of our snack containers. 10th August – Wildwaters Lodge to Lake Bunyoni. After a leisurely breakfast we set off mid-morning for Kampala with the intention of visiting Remmie (Suzan Kimera) and her orphanage in Entebbe. We quickly reversed this decision after becoming entangled in a traffic jam on the outskirts of Kampala and in the process of trying to avoid it, ending up on a road for 10km in a direction we did not want to go. The Ugandans have built expressways that are barely being used at the moment but once you’re on one, the exits are few and far apart. We needed to get to Lake Bunyoni so we cut our losses and headed on. Needless to say Lake Bunyoni is beautiful but very commercial. No gorilla permits available, so we stayed the night and headed to Rwanda the next morning. 11th August – Lake Bunyoni – somewhere near Nyabugombe, Tanzania via Kigali, Rwanda. From Lake Bunyoni, we headed straight for the Rwandan border with the plan of getting to Kigali and see what had happened there. The border crossing was slow but after about an hour we were on our way again. We were immediately waved at frantically by cyclists gesturing us to move over. We worked out we were supposed to be driving on the right-hand side of the road. Little facts all fell into place, Rwanda is French-speaking with francs as its currency, we were in a European ex-colony now, not a British ex-colony. Very cultivated, clean, the fields are cultivated from the wetlands right up the side of the hills to the top, hardly any motorbikes, many bicycles riding in groups when they could, to help each other. My impression was the Switzerland of Africa. Driving was slow going but we got to Kigali around lunch time and made our way to the Genocide museum. It was a Saturday and the museum was closed. We decided we’d seen enough and our next priority destination was Lake Tanganyika. I wanted to see the chimpanzees. We pushed on through Rwanda, another border post and into Tanzania where we hit a road that was more pothole than tar. Very slow progress. Eventually as dusk began to settle we found a motel in a village with a weigh bridge and booked a room for the night, only for the music to be turned on at full blast. We were assured this would stop at 10pm so we went to bed. 12th August – somewhere near Nyabugombe to Kigoma, Tanzania. At 1am the power went off stopping the music, but then the drunken arguments began and we decided to call it a night and hit the road. A long, long day on the worst roads we had seen so far got us to Kigoma around mid-afternoon and we found Jakobsen Beach and Guest House that had been recommended to us, and booked to see the chimpanzees the next day. Here for the first time we ventured into the town and topped up our supplies of fruit, bread and milk (which turned out to be cultured milk) from the local street vendors. Returning to Jakobsen’s, we spied a convoy of 4x4’s with South African registrations and lo and behold they were arriving at Jakobsen’s as well. 13th August – Kigoma to Gombe National Park where the chimpanzees live. We left Jakobsen’s at 6am by boat for the 3-hour boat ride to the Park. This day was the highlight of my trip. A very special experience to spend an hour, after trekking high into the hills, with a family group of chimpanzees. There were two young 13-month old chimps in this family group and they entertained us for the entire hour. On the way back our guide took us past the Waterfall and told us some of the history of Jane Goodall’s involvement with the Park. She still visits once a year at the age of 80+ and hikes up the steep hills to visit the chimpanzee families. Twelve hours later we arrived back at Jakobsen’s to pack and be ready for an early start the next day. 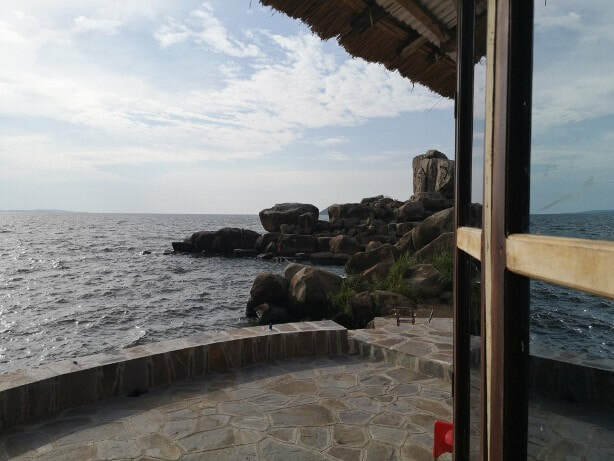 14th August – Jakobsen Beach and Guest House, Kigoma to Lake Shore Lodge, Kipili. After our last two days on nightmare road, this trip was sublime. Another less travelled road in pretty good condition, in parts through a nature reserve and then another winding pass down to the shores of Lake Tanganyika once again, at Kipili. 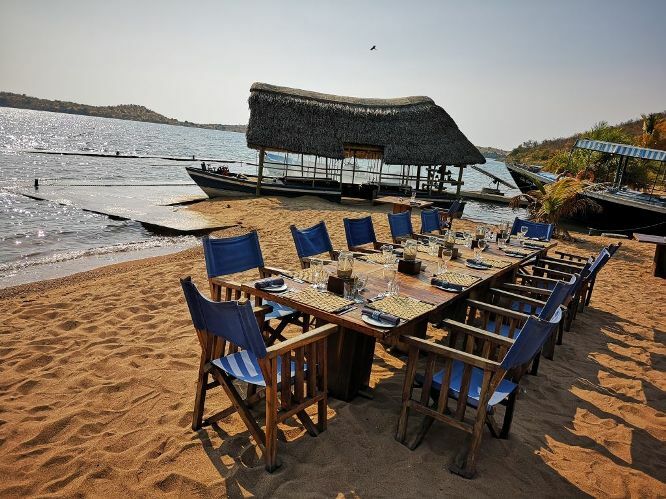 Lake Shore Lodge had been recommended to us by the leader of the South African convoy we met in Kigoma and it is another beautiful destination run by expat South Africans. A place that would be a dream honeymoon spot, supper on the beach, very carefully and tastefully decorated with the mosquito nets forming a room within a room on double double-beds. Not easy to get to but worth the effort. One of the places I would go back to for a longer stay if the opportunity arose. 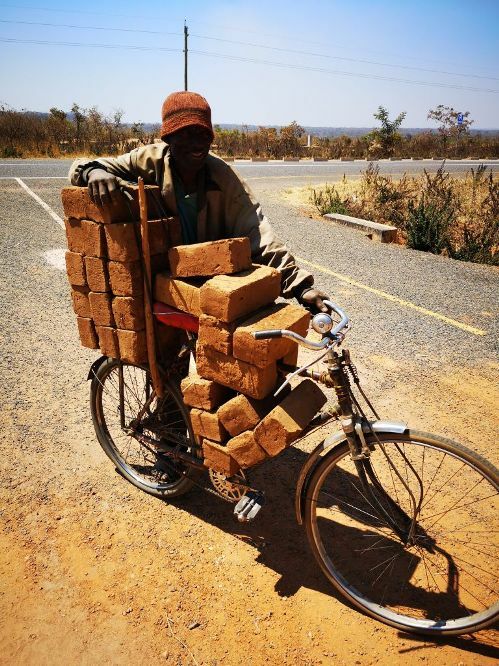 Along the way we met a man transporting bricks on his bicycle. 15th August – Kipili, Tanzania to Kapishya Hot Springs, Zambia. Another long day on the road but we knew where we were going. It also started to feel more like familiar territory although we had not been in this part of Zambia on the way up. Still it’s a SADC country and there is definitely a sense of being a part of this greater region. 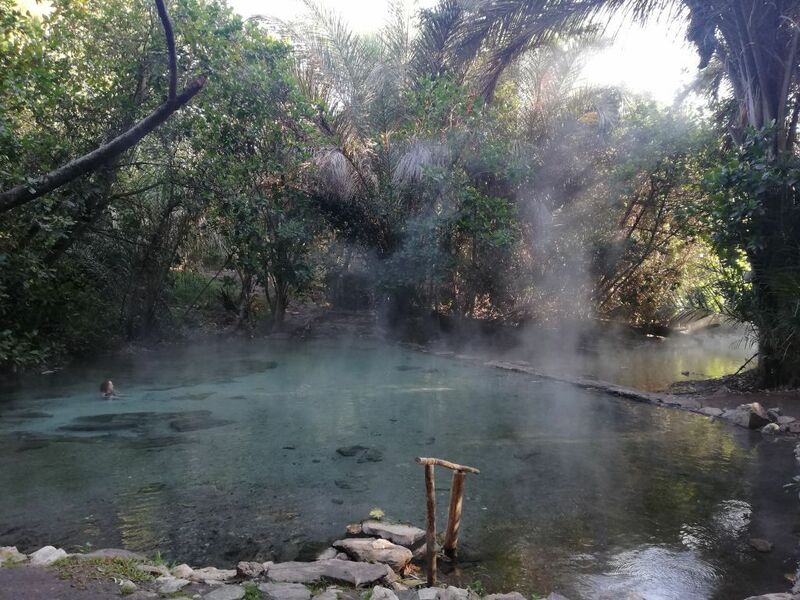 The hot springs are lovely, the lodge itself is overrated but it is one of the convenient stop-off spots between southern and northern Zambia. 16th August – Kapishya Hot Springs to just south of Mkushi, On this day we drove to my best friend, Janine’s sister Adrienne and her husband Simon’s farm near Mkushi. Being in Zambia and meeting Adrienne here after more than twenty years of not seeing each other was quite a sublime experience. Amongst the villages and subsistence farms in Zambia are still many large, white-owned agricultural holdings. Many of the Zimbabwe farmers moved to Zambia after being chased off their land in Zimbabwe. Adrienne and Simon farm seed maize, cattle and sheep while Simon is busy initiating a stevia crop. Adrienne is a natural gardener and has a beautifully landscaped garden and vegetable garden. That night we dined on roast lamb, broad beans and shelled peas, all from the farm, followed by strawberries. We filled up our water can and all our bottles with their sweet-tasting borehole water. 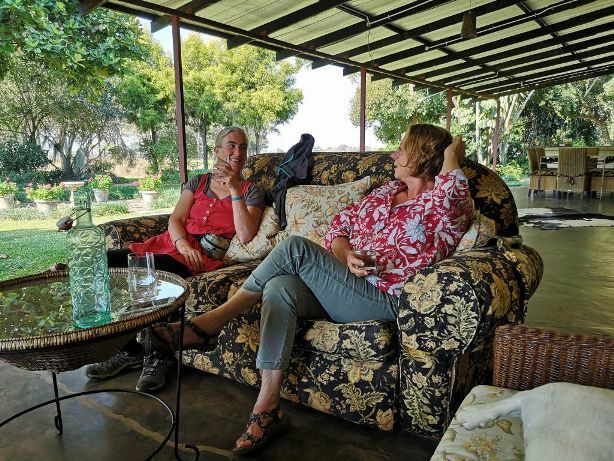 17th August – Adrienne and Simon’s Farm to Kaoma, Zambia. Our plan now was to get to Chobe, Botswana, spend three days there and head home. We’d also been advised to take a drive through Kafue National Park so we left Adrienne and Simon and headed south then west to Kafue to see how far we could get. We stopped once at the Fig Tree Café situated just after Kabwe on the Great North Road, if you’re travelling south as we were, which Simon had recommended to us for Cappuccinos (something we were missing) and fresh home-made pies (delicious). We also stocked up on curios and a decent toilet stop. A luxury stop. Later in the day we stopped in the Kafue National Park and managed to get a hoard of biting flies inside the Landcruiser. They bite and a day later the bite swells big and red. These flies followed us from there, through Botswana and it took a week after we arrived home before I stopped scratching. Worse than mosquitoes. 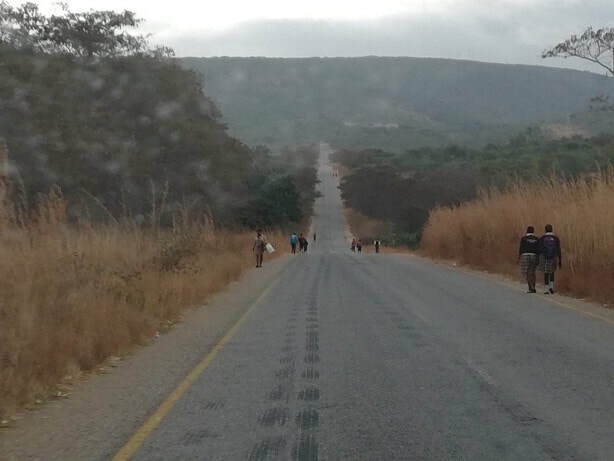 We managed to get to Kaoma just on the western side of Kafue and decided to stop there for the night as there is nothing else after Kaoma for another 200km and it was now around 4pm. We found a motel just off the main road and enquired about music and parties as it was again a Friday night and we were learning. No noise, local cuisine cooked on gas and a fire and a reasonable night’s sleep. 18th August – Kaoma to Thobolo’s Bush Lodge via Mongu, Zambia; Katimo Mulilo, Namibia and Ngoma Border Control, Botswana. We were up and out early before daylight again. We knew we had a long day and there were still some meetings we had not achieved. Amazingly, they happened on what was more or less our last day of the ‘What is in Africa’ part of the trip. From now, we were reverting to being mainly ‘game park tourists’. It was a day of many experiences, reaching the Zambezi River, recognising that this was the same river that is forms Kariba dam where we had crossed into Zambia on the way up. Crossing the Zambezi and driving along its banks for many kilometres. Driving across the Caprivi strip, David noted that when he was up there as a young soldier doing his National Service the people lived in the same kinds of houses, the kraals had not changed, the real difference was that now people had cell phones, other than that it could still have been the 1980’s. We decided to push through the Caprivi strip into Botswana and head for Thobolo’s Bush Lodge. Once through the border at Ngoma we were on the sand roads of northern Botswana that we were to drive on for the next three days. This was one of the few times that the 4x4 became essential. 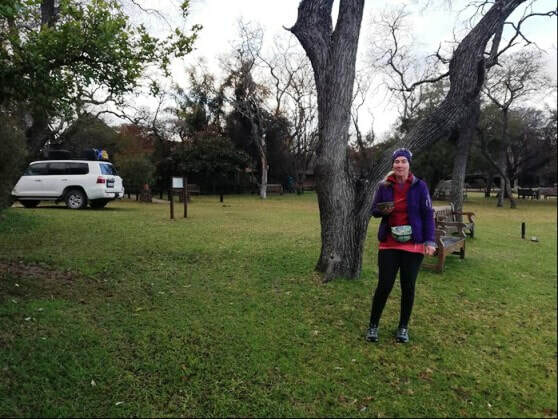 19th August – Thobolo’s Bush Lodge to Moremi North Gate. Thobolo’s had advised us not to stop at Savuti and head directly for Moremi as most of the game was either up near Ngoma, which we had missed, or still in Moremi, due to the late good rains. We took the advice. It was only a 160km drive but we took it slowly, taking in the environment and, when we spotted game, stopping and watching, so it took all day. 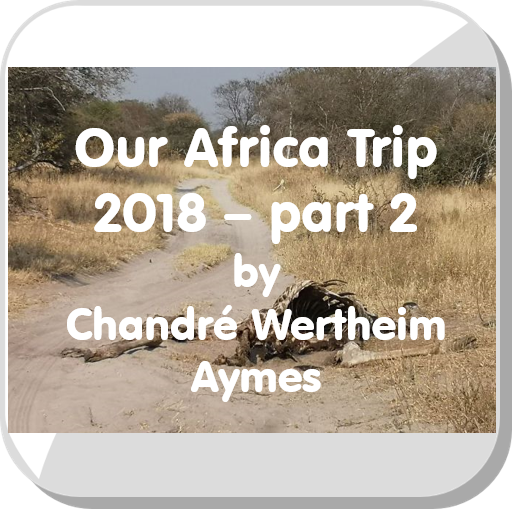 Once we were near Moremi we also took a few detours that resulted in us arriving at water crossings that we did not feel confident to try and cross, so we would backtrack and find another sand road to take us around. We did see a lot of game while negotiating this network of tracks on the edge of the Khwai River and the Okavango Swamps. 20th August – Moremi North Gate Camp to Moremi North Gate Camp. A day in Moremi driving around the eastern side being park tourists. Many wonderful sightings. Driving down narrow tracks through Mopani forests getting in and out of the vehicle to cut back branches that would scratch the Landcruiser, moving broken branches out of the way where elephants had been through. We did learn that on our next park trip we would need to bring a cattie for monkeys and baboons in camp sites and large pruning shears for opening up narrow tracks for wide Landcruiser. 21st August – Moremi North Gate Camp to Drifter’s Lodge Maun via western part of Moremi. We decided to spend half the day exploring the western side of Moremi and make our way to South Gate and Maun. Of course, it took us longer than expected and we found a couple of water crossings that we couldn’t avoid so David did the water depth testing thing with his special pole while I watched for crocodiles and other beasts of the wild. Needless to say, we made it through without any problems, but we did recognise that in the wet season in Africa you definitely go overlanding with at least two vehicles and with mud tyres on your wheels. David and I had last been in Maun in the early 1990’s when we did a mokoro trip after driving up from Johannesburg in his Beetle. Then it was a little village, now it’s a big town with mainstream supermarkets, tarred roads and rush hour traffic. No problems stocking up in Maun. Drifter’s is about 30km outside Maun on the Nata road right on the river. A beautiful setting. 22nd August – Drifter’s Lodge to somewhere on the Salt Pans. Our last day before we headed home, a late start as we had only about 100km to drive to the Salt Pan where we would spend our last night sleeping under the stars on the pan. It was hot. We found our way to the spot that Drifter’s had shown us, by lunch time, set up camp and David assembled the bicycles so that we could go for a ride on the pan. Despite the heat, that ride was an experience, 2km into the ride and car and tree had disappeared. We had been warned how easy it is to get disorientated and we found this to be very true. We had our Garmin’s, so we could easily navigate our way back, but it was a challenge for both of us to get back to where we started using our compasses, the sun and the wind direction. We headed out towards a black speck on the horizon which turned out to be an ostrich that started running once we got too close for his liking, we followed him for a while before turning back towards home on what would be a triangular route. Time to have a wash, prepare supper, eat and be ready for bed just after dark. 23rd August – Salt pans to home. It was close to the full-moon so the stars were not that visible in the night and it got very cold. We were both awake early and decided to pack up and head out. 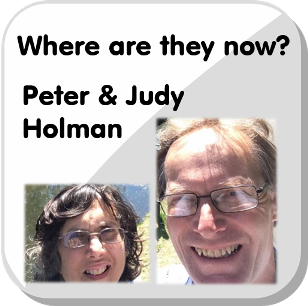 We were coming home, still a thousand kilometres to drive but that night we would see the dogs, Julian, Jynnie and Alfred who had cared for our home while we were away, and sleep again in our own bed after five weeks, shower in our own shower, find clean clothes in a wardrobe. It’s always good to be home no matter how fantastic the journey has been. This trip held so many new experiences that I think I will be digesting it still for many years. Writing now exactly two months since we got back I am surprised at how vivid the memories still are. I have to look up place names, but the images of the places and the experience of the different places still lives very clearly and strongly in my inner life. What all the fruits of this journey will be will only be revealed by time. I hope you enjoyed the adventure. Living in “turbulent times” is not confined to a geographical location or chronological time, be it in the past, present or future. Pointing to outer causes, such as political leadership or weather conditions will not suffice. Turmoil and dissatisfaction have always existed. Historical examples of times of real crisis, such as the depression, wars, even as far back as 1177 BC, according to Eric H. Cline, when civilisation collapsed marking the end of the Bronze Age. Empires collapsed from within, where there wasn’t a centre to sustain them. Although changing external condition may sometimes be necessary, like moving home, we always return to ourselves and our own interior condition. Rudolf Steiner mentioned three harmful attitudes that enslave us and represent a real attack on the individual, if we provide a dwelling for them and allow them influence, DOUBT, HATRED and FEAR. The counter picture to these three is given in the Gospel of LUKE 17. CERTAINTY being the opposite of DOUBT. To have confidence, conviction and be sure of the validity of what we do and stand for, in a time where truth is being undermined, requires certain personal initiative. Not rigidly holding on to a specific way of life, but understanding the process of change and unfolding, with the ability to let go when necessary to preserve the essence. Verse 33: whosever seeks to save his life will lose it, and whosever loses his life will preserve it. Such personal initiative makes all the difference between those able to be receptive and discerning, i.e. able to receive and feel a connection with, as opposed to those who feel alone, isolated and excluded. Verse 35: Two women grinding at one mill; one will be taken and the other left. Verse 36: Two men will be in the field, the one will be taken and the other left. GRATITUDE – the Greek word CHARIS or GRACE is our response to God’s gift. EUCHARIST – I give thanks for receiving the Grace of God. Thanksgiving is the opposite of HATRED. An attitude that is not grateful is hateful, as the example of the ten lepers who were cleansed in verses 11-19. Only one was able to discern that he was healed and returned to give glory – DOXA – this required a recognition of the essential substance of God. FAITH – in Latin FIDES meaning Steadfastness; in Greek PISTIS suggests openness, one who can be persuaded or influenced, and is the opposite of FEAR, which blocks, closes and shuns in defence. When the apostles asked for their faith to increase (verse 5) Jesus gives the example of servants doing their duty (verses 7-10) bound by obligation. One can also choose one’s duty entirely out of the freedom. FAITH is synonymous with freedom – unlike belief – as it can increase the ability to be influenced by Christ-in-us in everything we do. The Greek word for body is SOMA – and the gathering of the mighty healing forces uplifting humanity. A final picture of our humanity, like an acorn in the palm of God’s hand. On the 22nd July 2018 at around lunch time, David and I drove out our gate in the Landcruiser GX200 that David had bought last year as his ‘last car’. We looked at each other and said: ‘This is it, what comes will be.’ I certainly felt a mixture of nervousness and excitement, we were going on an adventure again after quite a long hiatus while the family had been growing up. We would be away for five weeks, the longest either of us had been away from our home since we moved here. The planning for the trip took about two months and as we drove through the gate we both felt that we had done as much as we possibly could during the planning stage to assist in making the trip a success. The planning had consisted of researching the types of conversions needed for the Landcruiser so that it could handle the off-road conditions we might meet in Africa, which tyres to put on and what equipment we would need. We decided during this phase of the planning that we would be camping along the journey but decided to limit ourselves to the minimum necessary to camp comfortably. The other part of the planning was researching the possible routes and how long it would take us. 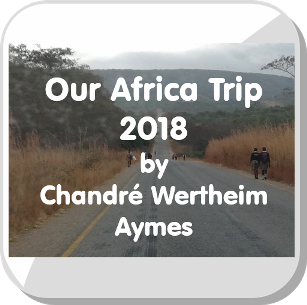 I probably spent about two weeks just looking at Google maps, cross-checking against Tracks 4 Africa and searching for possible accommodations at our planned stops. I also spent many hours on the 4x4 Community Forum website researching information on border crossings, where to go, conditions, places to stay and driving conditions. I sent out queries to other ‘overlanders’ I had found and read their blogs in an attempt to get some sort of feel for what we could expect. It was all very helpful but like any threshold experience no-one can truly prepare you for the reality. 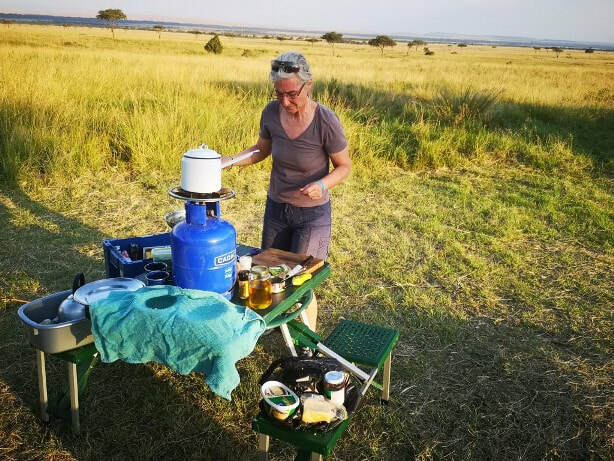 The All Africa Anthroposophical Training conference in Nairobi started on 1st August and I had made one booking for us in the Mara Triangle on the 31st July for a night in a Private Camp, that was our deadline for the first part of the trip. We had a schedule of how I thought the days would unfold but this schedule changed quite quickly on Day 3 as we managed to get further than we expected and new plans arose for Malawi. 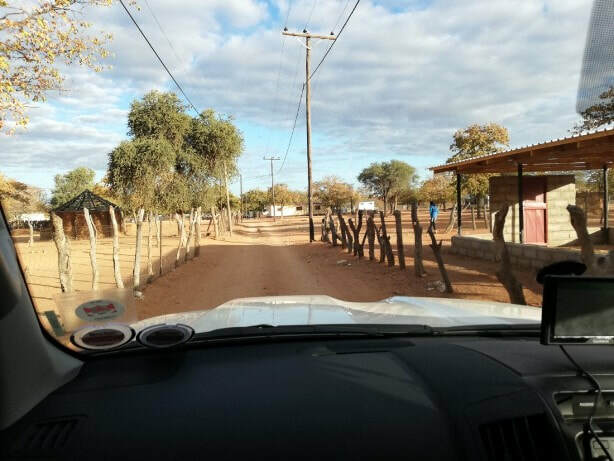 22nd July – Left Johannesburg and drove to Martin’s Drift in Botswana – Border crossing: Martin’s Drift. Accommodation Kwa Nokeng Lodge. The lodge is right next to the border crossing and the trucks make a noise all night. We both were awake around 4am on the 23rd so we decided to get on the road, we knew we had a long day ahead of us and thought we would take advantage of the early hours to break some of the journey’s back. 23rd July – Martin’s Drift to Antelope Park, Gweru, Zimbabwe via Bobonong, Mphoengs Border Post and Bulawayo. Lots of sand road through rural Botswana and Zimbabwe. The first part to Bobonong in the dark. Withdrawal symptoms from our daily caffeine shot. This was the day that we learnt a lot about our GPS apps we had with us. We had bought a Garmin and installed Tracks4Africa on it. During my overland research I had come across a mention of an offline navigation app called Maps.me so I installed this on my phone for free and downloaded the maps of all the countries we were expecting to visit. Well, this little app turned out to be the best when we hit the sand roads and went very rural. Over the days we learnt to trust this app when Garmin and Tracks4Africa had no idea where we were. 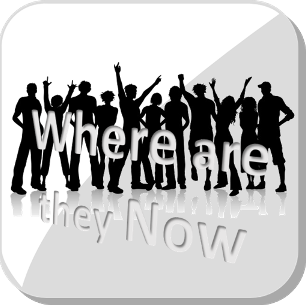 From Martin’s Drift until we hit the main Plumtree/Bulawayo road in Zimbabwe we were in the bush and relied heavily on this little app. 24th July – Antelope Park to Lusaka, Zambia via Kariba. The original plan had been to stop at Kariba, but we were there by lunch time and decided to push on. 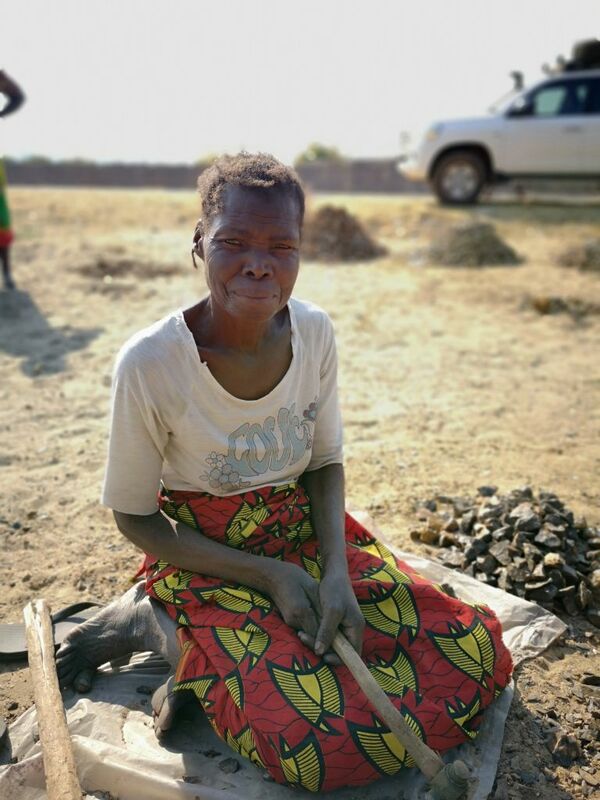 We had made plans with Alfred our gardener in South Africa to meet his daughter and mother in Mzimba in Malawi on the Thursday and we started to realise that firstly we had miscalculated the days and secondly maybe we could get to his house. Nevertheless, we arrived in Lusaka in rush hour with no idea where to stay, frantically trying to find hotels on the Great East Road, which is where we wanted to leave from early the next morning. Two and half kilometres and an hour later we stopped at our first choice to be told that their rates were in USD. They very kindly found a comfortable hotel close by that charged local currency rates for us. 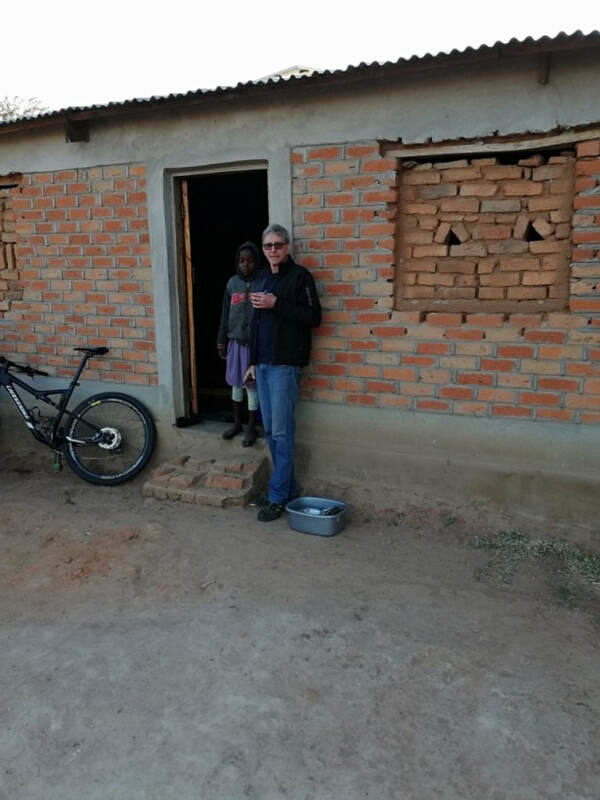 25th July – Lusaka to Alfred’s house in Malawi (somewhere north of Edingeni and West of Mzimba near the Zambian border) via Chipata, Lundazi border crossing and Edingeni. Very early start again before the morning rush hour and breakfast in the car. We did this often. I had brought my homemade muesli along which we topped up as we needed – the first batch got us all the way to Nairobi where I could shop for more oats, nuts and dried fruit with which to top up, in a proper supermarket. I would buy yoghurt and milk or cultured milk or long-life milk and bread at the diesel stops or when we stopped in a big town, which in the SADC countries generally had a Shoprite. In Tanzania this became more challenging. Breakfast would be muesli and lunch would be sandwiches with cheese, jam, peanut butter and honey and fruit, if we had. Sometimes we would stop, but on the long days I would just make it on the go in the car. I also had a bag full of snacks such as nuts, dried fruit, sweets and biscuits for the in-between times. David is a snacker when he drives. By now we were beginning to realise that what we were seeing is reality: village after village after village with charcoal, wood, tomatoes, red onions, cassava, sweet potatoes and potatoes for sale. When we were near a big river, lake or dam there was fish for sale. Occasionally at a bigger marketplace we spied meat hanging or being cooked over a fire. In places there were groundnuts and bananas (generally very green). Children walking to school in their uniforms smiling and laughing. Bicycles for transport, single speed, no brakes. Curiosity about our vehicle, friendliness, openness, uncomplicated meetings. On this trip I never plucked up the courage to just go and wander through a marketplace. Too many people in one place and too much noise for me. After a delay at the border post we drove into the night following Alfred’s directions to find his house. 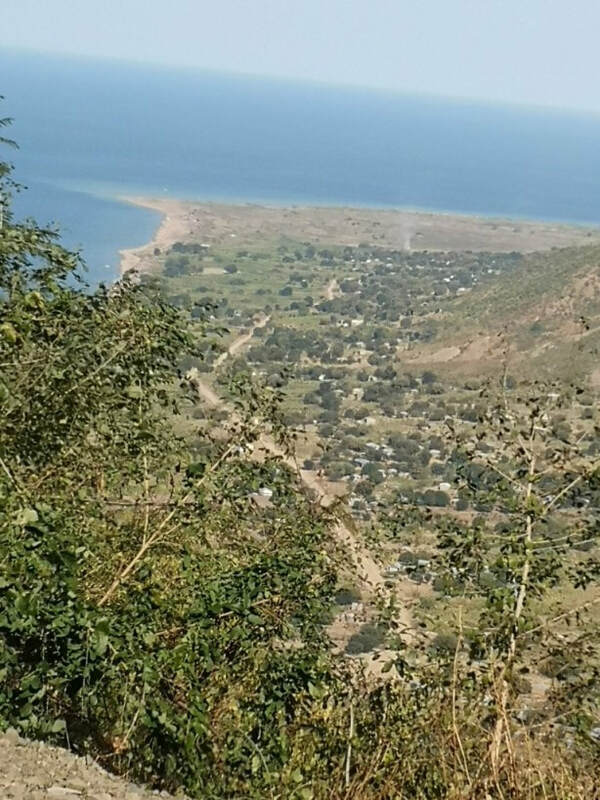 26th July – Alfred’s home to Karonga via Mzimba and Mzuzu. Stocked up at the Shoprite in Mzuzu. The first short, more relaxed day after three long days of travelling. 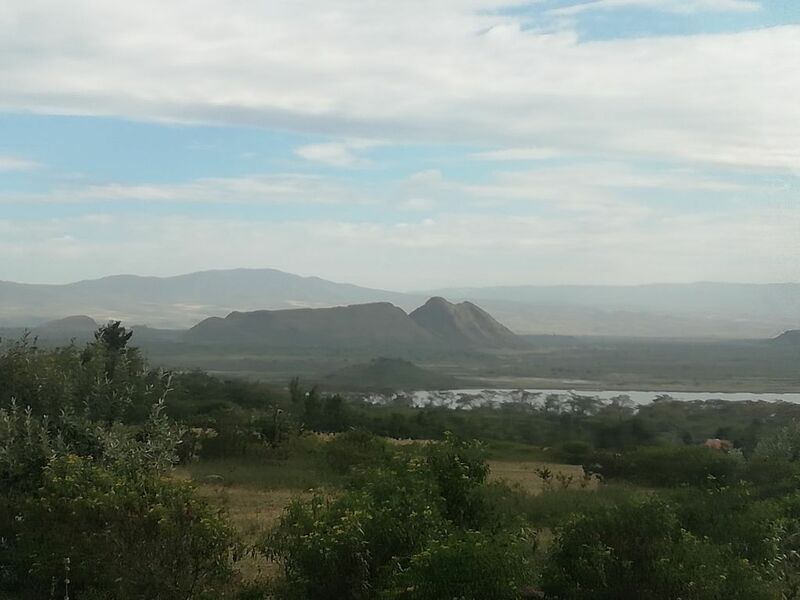 ​27th July – Karonga to Isimila Stone Age Site just south of Iringa. Interesting stop: I had read about accommodation here called Isimila African Garden. When we arrived it was deserted except for one old Tanzanian. Anyway, he welcomed us and the rondavel room was clean with a king size bed, hot running water and a flushing toilet, so we stayed. The owner arrived some hours later, also a Tanzanian, who spoke, according to David, impeccable German and was very drunk. 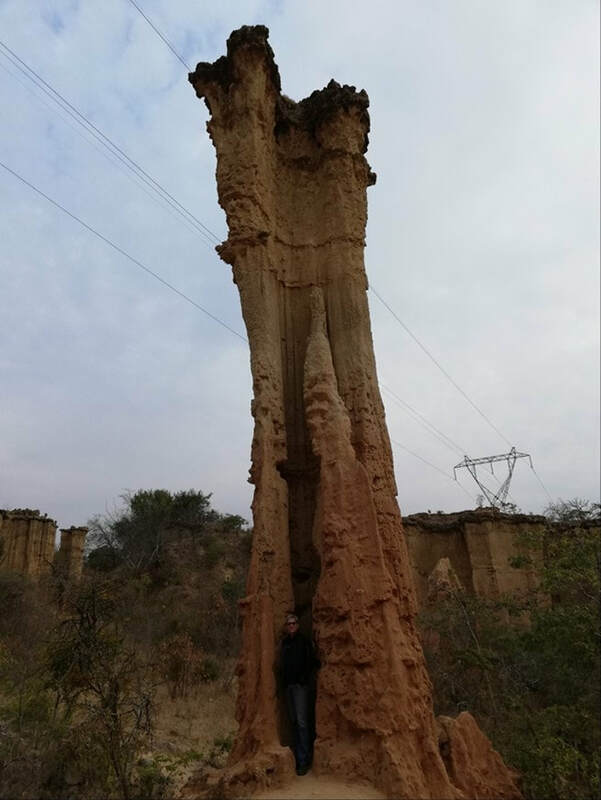 We had time to take a tour of the Stone Age site with its incredible erosion pillars. The erosion continues. This was a special find. 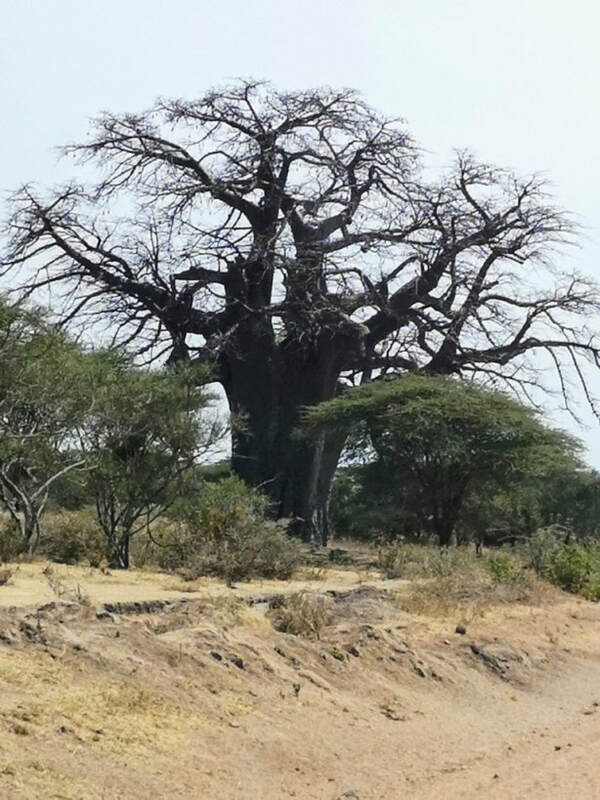 We had debated during this day whether or not to detour through the Ruaha National Park as we had been told how beautiful it is. We decided that this trip was not about Parks and Wildlife but about finding out about Africa and so we found Isimila instead. We also started to get a feel for how long it took to drive any distance in Tanzania, our hours in the car were still long but our distance was now less each day. 30th July – Musoma to Oloolola Public Campsite via Isibania border post and Migori, to draw Kenyan currency. We only had about three hundred kilometres to travel on this day so David left early again on his bike and I found a shop on the way out of Musoma to stock up on some basic supplies. The next two nights we would be camping in the Mara Triangle before we headed to Nairobi and the conference. For me, Kenya was, I think, a culture shock after the simplicity of Tanzania. Much dirtier (rubbish), much noisier, many more motor bikes. The border post on the Kenyan side was a free for all and I had to learn to stand my ground and hold my place once I had worked out the order of things. Our first day in Kenya consisted of the border crossing – hectic – and a quick detour into the town of Migori for local currency and then we retreated to the quieter simpler way of life of the Mara Triangle for two days. A very beautiful and special experience, especially our second night in the Ndovu Private Camp, which is literally a cleared space in the bush where one can put up a tent on the bank of the Mara River with a herd of twenty-plus hippopotami living in the river below our campsite and one crocodile, that we saw. It has to be booked in advance but once booked it’s yours for the night. This I could do again for more than one night, one truly is away from the complexities of life and a part of the rhythm of nature. A necessary breather in our busy, complicated lives. 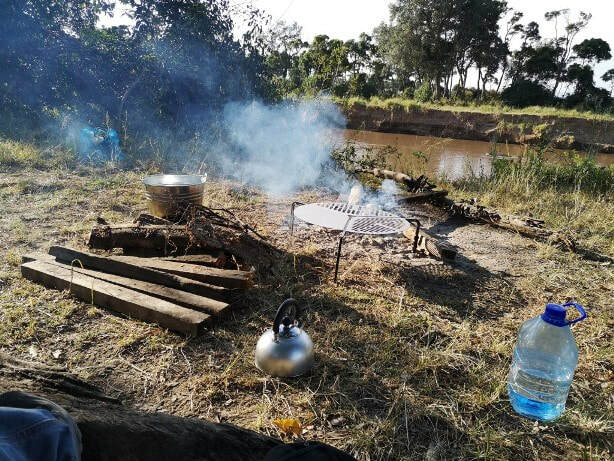 ​31st July – Oloolola Public Campsite to Ndovu Private Campsite through and around the Mara Triangle. ​28th July – Isimila to Singida via Dodoma. A day of good tar roads and finding out that there is a village approximately every five kilometres in Tanzania. Lots of trucks and buses along with the bicycles. David left earlier on his bicycle and I found him on the road later with the Cruiser. 29th July – Singida to Musoma via rural roads through Maswa and Old Maswa, three hundred kilometres of sand road. In two days we had crossed two thirds of the East-West distance of Tanzania and arrived on the eastern shores of Lake Victoria at Musoma. We were getting close to our first planned stop in the Mara Triangle. In fact, we were a hundred kilometres from the Kenyan border. By now we had found a rhythm to our days of travelling but we were looking forward to some shorter days and the experience of the Mara Triangle. 1st August – Ndovu Private Campsite to the Franciscan Family Centre in Karen Hardy, Nairobi via Narok and Limuru Town to the AAAT Conference. 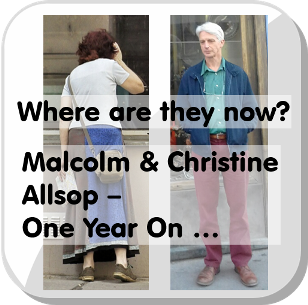 I will continue Part II in next month’s newsletter with Our Return Journey. 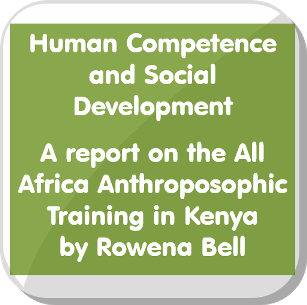 The All Africa Anthroposophic Training took place in Kenya from the 1st - 8th August. 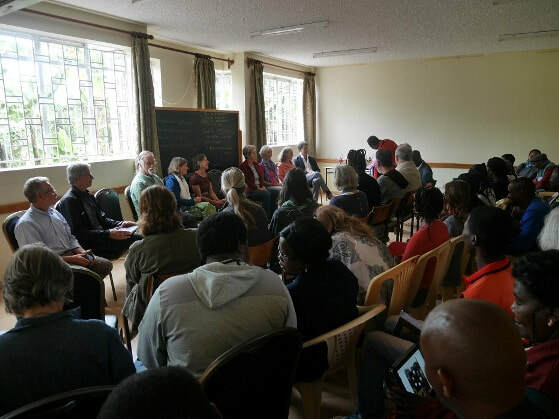 Nearly 70 delegates were hosted by the Franciscan Family Centre at Karen Hardy in Nairobi. The welcome we received from Vincent, Bruno and Julia was heart-warming and our hosts offered an excellent venue. The days were full, with the morning work concentrating on human faculty building, encompassing thinking, feeling and willing. The afternoon sessions were designed to enrich our professional lives. The evenings consisted of summaries of the day’s work given by delegates, followed by Michaela Gloeckler leading us on a journey through individual and social development. The mornings began with an invigorating session of eurythmy led by Cobie Roelvert, followed by a short introduction to the day. Thereafter, in small groups, we were tasked with observing the four elements of earth, water, air and fire in our individual capacity, from three different aspects: our knowledge, our observations in the present and then how the elements related to our humanity. 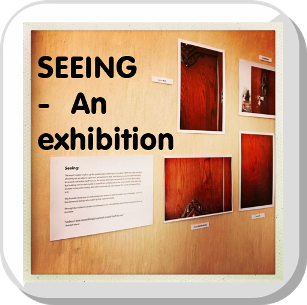 The sharing of this work, which was guided by a facilitator, stimulated lively conversation and inspiring insights. The morning was rounded off by working through the Seven Conditions of Esoteric Training. I personally found exploring and understanding these seven conditions a strenuous but rewarding process. Daily, the eurythmy reflected the themes in an inspirational way. We experienced the solid earth, the fluid water, the rushing air and the flaming fire in movement. We practiced threefold walking and felt ourselves as noble pillars of light. We experienced the vowels and then, to our wonder, saw how these gestures can be found in nature. I found them all represented in a banana tree! We were led through the evolutionary sequence of the consonants and experienced the connection to the four elements. The daily report back sessions were inspiring and indicated that all the above workshops were excellent. It was good to get a glimpse into and overview of the work. My focus was Biodynamic agriculture, which was attended by a large number of delegates. The concern for the fertility of the earth, heirloom seeds sharing and wholesome food is great. Our theoretical work was done at the Franciscan Centre and the practical at the farm of the Mbagathi Waldorf School. Angela was a shining example of transforming desert sands in fertile lands. Our group highlight was making Cow Pat Pit and the eventful journey to the school through congested traffic on poor roads, passing the many roadside vendors. We had a chance to experience Nairobi. The evenings were presented by Michaela and what a seven-day journey it was, encompassing so much food for thought! She asked the question: “How can we be educated so that this gaping gap between wealth and poverty can be tolerated by human beings today?” She stated that the social problems need educational solutions and that educational problems need therapeutic solutions. Michaela said that the highest social competence is, to know your self. An antisocial drive in our thinking is the desire to convince the other that our opinion is right, whereas being socially competent is learning to come into conversation and help the other to become a better thinker. She pointed out that a seeker of the truth will sacrifice his opinion in the quest for the truth. As Christian Morgenstern said, “Those who are looking for the truth have to go alone.” The antisocial drive in feeling is projection and we can overcome this tendency by learning to live with the expectation that the other is different from what we think, and that we respect that we are all developing human beings. Development means being open! The antisocial drive in our will is when we act and disappoint others, whereas being socially competent is questioning ourselves before we act, knowing that when we do what is needed, we respect the freedom of others and make them happy! To be socially competent is learning to look from the other’s and not one’s individual perspective. She pointed out that evil is in the world so that we human beings may wake up to the good! The highlights of the conference were many. I loved meeting my brothers and sisters from Africa and have returned to South Africa knowing that each delegate will be returning home, carrying his/her light and ‘lighting up’ our African continent. My personal aha-moment was that we human beings are masters or ‘expert handlers’ of warmth, and therefore we are the transformers on the earth and have immense power. Do we harness this power or abuse it? Even more significant, are we conscious of our power? We were addressed by Victor who informed us about the growing Waldorf movement in East Africa. Father Herman had the occasion to address us and tell us about his work as a Catholic priest in Kenya. He celebrated mass on the Sunday morning for those who were interested, and Richard also celebrated The Act of Consecration of Man on three occasions. As we were staying in a Franciscan place, Michaela closed the day with the prayer of Saint Francis. She invited delegates to recite the prayer in the different languages from the continent, which was another highlight. A big thank you to all who made this excellent and enriching conference possible, and especially to Michaela, Vincent, Julia and our Franciscan hosts. 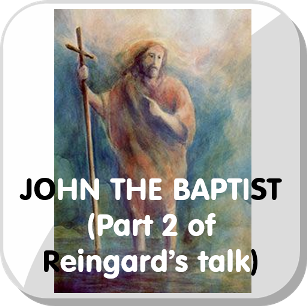 John the Baptist is foremost a witness because he was there at the Jordan at the incarnation of Christ. The role of a witness is of vital importance because it influences the event. Parents who witness the development of their children can easily understand this. They guide and are actively involved in the process of child rearing. Likewise, a swimming coach at the side of a pool can observe and correct the stroke of a swimmer precisely because he has a different point of view. The swimming coach has a comprehensive knowledge of the art of swimming and knows what to do to improve a swimmer’s technique. From the side of the pool he can observe (witness) and influence the outcome of the swimmer’s development. 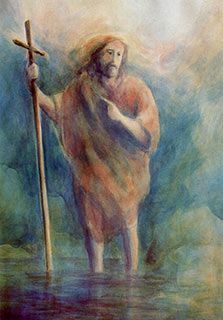 On the banks of the river, John the Baptist is the one who knows what is to come. He is the one who says: “See the lamb of God. He carries the sin of the world.” Jesus does not know. Like the swimmer, Jesus can only bring his experience, his pain and his suffering to the event at the Jordan. At this point Jesus, surrounded by decadence and deeply touched by the plight of human beings, has lost all hope. Like the swimmer in the pool, Jesus has no insight, no objective view and no idea how to move forward. In fact, when Jesus arrives at the Jordan and asks John to baptise him, John at first refuses. It is you who must baptise me, he said. As a highly developed clairvoyant, John knows the true meaning and purpose of Jesus. At that moment there are two people at the Jordan carrying two different qualities. The one is the Witness who knows what the future holds. The other is the Carrier of his past experience. If we know that as witnesses we have the power to influence events, it would be wise not to neglect this responsibility. Fortunately, we do have a yardstick that keeps us on track. We have a conscience, a moral compass that determines how we stand in relation to the world. It is the inner conversation I have with myself every day. It is the effort to align myself with my truth. It is taking responsibility for my life and my actions. It is also true that we carry the conscience of a country or a nation. The individual contribution to the world is now needed more than ever before. The function of an active witness in the world is an arduous task. We might be inspired on a Sunday in front of the altar to rise to the challenge, but by Wednesday, the flame flickers and dies. It is helpful to approach our task in small steps and commit to our purpose every day anew. It starts with making small changes and a willingness to change one’s thinking. To be the coach and swimmer, we need to develop the ability to see everything from a different point of view and then make it our own. We are our own masters. The responsibility of staying on track is ours. 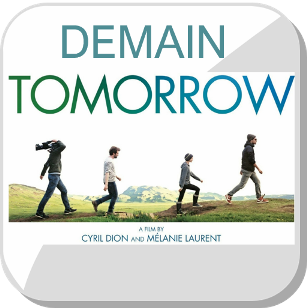 It is very easy to understand why this movie has made such an impact around the world. It brings a message to us all – WAKE UP! I see it was filmed in 2014 and even in the 4 short years since then the broader situation that we as humans on this planet are facing has escalated, unfortunately for the worse. International leadership is now clearly showing itself to be a farce. How is it possible that world leaders can lie blatantly, day after day, with no consequences at all? The systems that we have relied on, that have previously held everything together, are breaking down, leaving us lost, leaderless and, a lot of the time, helpless in our powerlessness. How wonderful to find there is a “but”, a great big one at that. In the middle of being flung from one crisis to another and despite all the chaos, mayhem and heartache it is a relief to find that we are not alone, we are not helpless. There are those who will not simply accept the status quo and keep going as if nothing is happening. Dotted all around the globe are individuals, communities, companies and even cities working and striving with solutions that are successful, profitable and sustainable. What I loved is how open these people are about what they are doing. They are welcoming and encouraging everyone to participate in the change that they are working with already. So different from the closed "this is mine only" attitude. There is so much that can be taken away from watching this film. We can have a different picture of our future and know that it is achievable because others are already living it. It was wonderful to see that we can change. Yes, we CAN CHANGE! But we must change. All the challenges with which we are faced bring with them something, an opportunity, a chance to make a different choice. Choice, our greatest of human rights. The world we live in has been created for us with great sacrifice and love by the spiritual world. The spiritual world has withdrawn its outer support and now we are responsible for what happens next. I would like to thank Sophie Turner for bringing this movie to our attention. For the hope and courage that it brings so that we can see a way, a new way, for our future. ​Fund-Raising Film Show a Great Success! 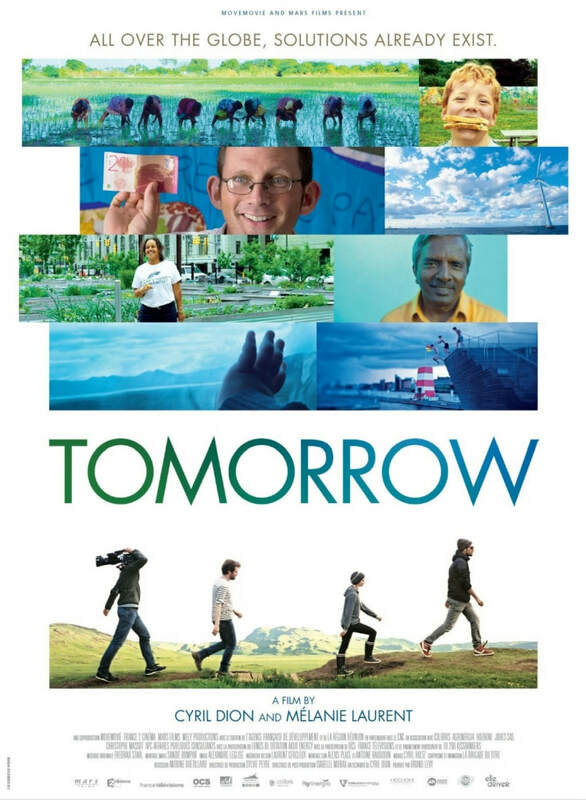 Around 50 people turned up to watch the inspiring film 'Tomorrow' on Sunday, 22nd July. The event was a great success, both as an experience and also as a fund-raiser. Jean provided delicious scones that disappeared before our eyes; Sonnya baked fantastic bread that had everybody taking; Thomas brought the projector. Bert brought his equipment, set it all up, and stayed to be our projectionist. Anne-Marie and Leila collected the donations and George and David washed everything up afterwards. The time of St John has passed, and we move into a ten-week period between the end of St John’s Tide and Michaelmas. 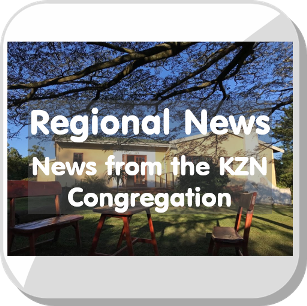 There is still a strong connection that St John’s Tide has with our region – the current crisis in water management in the Cape provinces, the dry desert of Namibia, and the wet eastern parts of South Africa: Water! 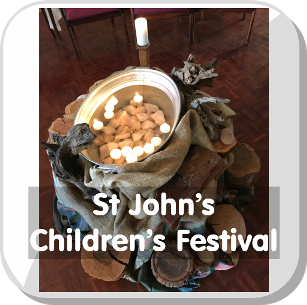 With the lighting of great bonfires in Waldorf Schools at St John’s it is often fire that is most strongly associated with John the Baptist, yet water was the great medium he used in baptising. A deeper appreciation for water may prove informative and inspiring. Water powers our minds and bodies more elementally than any other substance. Without water, there would be nothing. Nothing flowing through the intricate network of veins and arteries on the Earth’s body, lubricating its soils, shaping its cavities, and depressions and fuelling its inner store of fertility. Without water there would be nothing to quench thirst, nothing to bathe in, nothing to wash away impurities. No green shoots, no animal or insect life, no fish, no fowl, no milk, no blood, no growing embryo. There is something about water, of course, that defies categorisation. It is present in everything. In all stages of the plant for example: root, leaf, flower and fruit. It flows through everything that has life, it is truly the bearer of life. Yet, it also evades our grasp as quickly as we try, both physically and metaphorically, to catch and contain it. It erases as much as it creates and is in constant flux and change. Theodor Schwenk’s studies on water reveal that water drops made different drop pictures depending on the quality of the water. 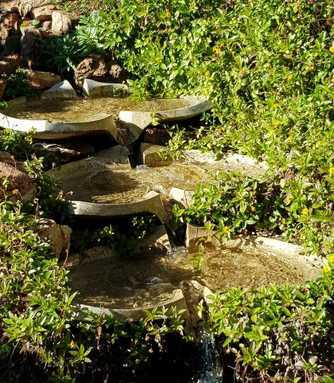 Fresh spring water produces images like flower petals, lesser-quality water produces pictures that look like flower stamens, while waste water gives rise to concentric circles in no “living” pattern. Water enables all things to reveal their innate character. From a saturated solution, for instance, salts emerge as crystalline formations. So water becomes the symbol of the soul quality that brings out the very best in others. This is the art of listening so completely that others are able to reveal their true nature. In this way, if we are like water, we are able to absorb but not own, reflect but not distort. It is that quality that truly sustains us on a spiritual level, just as water sustains all physical life. The water researcher John Wilks provided some remarkable insights into the movement of water in the early 1970’s. His research and insights seem to have been largely ignored but they have produced the “path-curved surfaces” now referred to as flowforms. Wilks observes that in living things water expresses a rhythmic movement flow outside in the world. This formed the foundations of the flowform designs. Water has a laminar flow pattern – a pulse if you like. When channelled, water tends to swing and on a large scale, when not inhibited by too steep a gradient, a river naturally meanders. For the past half century research has continued to perfect flowforms which both scientifically and aesthetically maximise the life-enhancing qualities of water. In discovering the natural potential of water, may we also discover our natural ability to symbolically be water to each other. I remember Reingard travelling to different parts of the country over several years to meet with a diverse group of youths wanting to explore various questions. 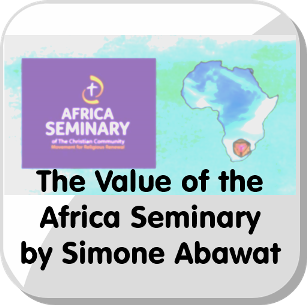 I remember hearing then the first whispers of an Africa Seminary, and now those threads are being woven together in what is a full – albeit infant – expression of a Seminary impulse taking root in Southern Africa. A while ago I moved to Knysna where life slowed to a gentle roll. It’s peaceful here, and easier, and every day I’m newly surprised at the prettiness of my still novel surroundings; my short drive to work winds through a soft mist lining the valley on my right, and past the glossy loveliness of the lagoon on my left. I feel too lucky and although it’s hard to leave, I was also extremely fortunate to be able to attend Module 3 of the Africa Seminary in Johannesburg. More and more I am baffled by illusion and misdirection I observe. Money seems to stand behind just about everything; profit is the measure of success, agency, freedom; those who step outside popular thinking are vilified and labelled dangerous; science is hammered home as the only truth, and truth itself is harder and harder to recognise. Everywhere there is a sense of humiliation, of not belonging, of being neither seen nor heard, and of unmet need. Perhaps it’s clear that a new way of meeting the world is needed, but I for one, wouldn’t know where to start were it not for Steiner’s teachings and The Christian Community. The future, it seems, asks for qualities built on a groundwork of a new wisdom and a new morality, surely? 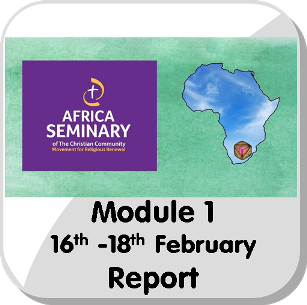 So, my experience of the Africa Seminary is that we are offered an insight, a map and tools - and the most gracious of guides - with which to start shaping those qualities. 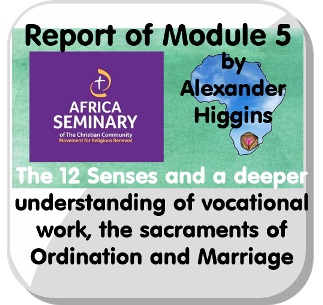 As the content of the Seminary continues to unfold in me, I notice the reverence and the humility with which it was all offered – for the human being, for the spiritual worlds, for the need of humanity. I returned to lovely Knysna with a new vision and a new strength, feeling even luckier than when I left. In the Gospel of Luke, Zachariah is instructed by an angel to call the baby his wife Elizabeth is to conceive, John. The Gospel also tells us this is not a family name. In the Prologue in John’s Gospel, the writer goes back to the beginning of Creation. He then writes: “There came into being Man, separated out of the Divine, bearing a universal proper name IOAness” (http://www.gospel-john.com/greek/chapter-1.html). Then, he tells us that this IOAnnes came as a witness, to testify to the Divine Light. Who is John and what is the importance of the festival of St John? From the Prologue in John’s Gospel we immediately sense that this is not just about an ordinary human being. We also know that there are several people in the New Testament who bear the name ‘John’: John the Baptist; John the brother (of James); Peter, son of John (Jn 21); John the Evangelist; John who received the Revelation. We can sense that John is connected to the beginning of all time (Prologue of John’s Gospel) and to the end of all time (Revelation). ​When we go to the beginning of time, we read in Genesis the Elohim saying: “Let us create a being that is equal to us”. This statement reveals that there is a purpose to this creation. The Book of Revelation reveals the end result of this creation. (Christianity is the only world religion that reveals an end product to the creation of humankind.) Clearly, we are still somewhere in this process of becoming the purpose of this creation. This sacrifice made possible the aims of the Elohim, that humanity can move towards it’s true name. What is this name? It is the ability to say “I” of oneself. This name separates us from everyone else. This is also the nature of Original Sin: the separating out of the individual from the wholeness. When Moses encountered the burning bush, the Word of God speaking from the bush says to Moses: “I Am the I Am”. When John the Baptist witnesses the Spirit descend on Jesus in the form of a dove, this “I Am the I Am” enters into a human biography. “I Am the I Am” expresses that this Being is the I-source of all individual ‘I am’ – therefore the universal power overcoming the separation in new unity. In Revelations, John sees the image of the Throne surrounded by the 24 Elders and the seven Elohim and in the middle the four Living Creatures and in the right hand of Him who sat on the throne a scroll sealed with seven seals. No one was able to open the seals. Then the Lamb with the appearance of being sacrificed, stands in the centre to receive the scroll. The “I Am the I Am” makes the sacrifice that the seals can be opened and the biography of humanity can continue to be fulfilled. John the Baptist, who fully understands the sacrifice of the Adam soul, stands at the baptism as the witness of this Being incarnating in Jesus, who is making the great sacrifice for the fulfilment of the goal of the Elohim and humanity. John is the first human being who understands the need to prepare the soul to receive the true “I Am”, that it is a path of spiritual maturing to BE “I Am”. When John is again experiencing the state of separation in prison, where Herod and his wife Herodias throw him, and sends his disciples to ask Jesus if he is the awaited One, Jesus Christ responds with examples of healing, indicating that He is the One who reunites that which has been separated. 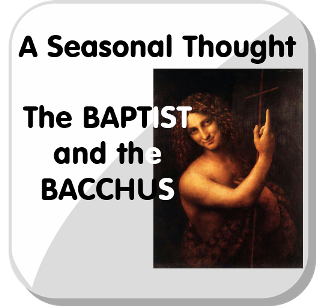 All this opens up a sense that there is far more to grasp and penetrate when we ask, ‘who is John the Baptist’. 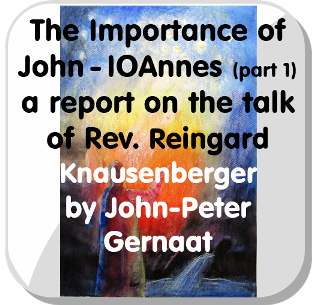 The conversation into the name and the importance of John continued on Sunday, 1st July. 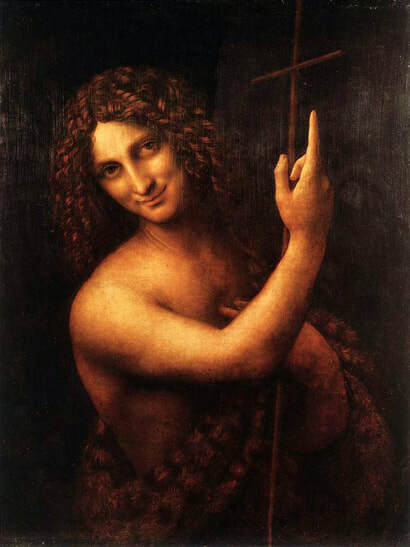 There are two paintings of St John the Baptist by Leonardo da Vinci, both now in the Louvre. A reflection on them could well provide a deeper insight into the person of St John. 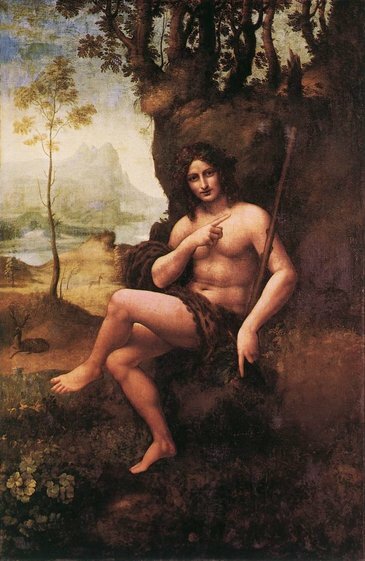 There is the half-length, dark-grounded St John, and there is the larger painting of him full length, sitting in a landscape, which it is convenient to call St John in the Desert, though by virtue of certain additions to the figure, the painting is often referred to as St John with the Attributes of Bacchus. The date-range for these late works is broad, but in its beauty and mystery, the half-length St John seems more than any of them an enigmatic final statement, or indeed a final question. Like all da Vinci’s late works, the St John is the final stage of a long process of definition and redefinition. The earliest recorded stage is a small sketch at Windsor which is on a sheet containing studies for the Battle of Anghiari and is therefore datable to c.1504-5. Compositionally, the St John has its roots in that Florentine period in which other late works like the Leda and the Virgin and Child with St Anne also came. The Windsor sketch actually shows an announcing angel – the angel Gabriel – rather than St John, but the pose is the same, with the right forearm pointing vertically upward, and the left hand pressed against the chest. In this St John one meets all sorts of contradictions, not only between feminine and masculine, but between a certain sadness and a serene peace. The effects of age must surely play a part in the overall darkness of this painting, but this is merely an exaggeration of the original effect. The three-dimensionality of the figure is achieved by its being brightly lit against a dark background. This chiaroscuro effect is present to a greater or lesser degree in all of Leonardo’s paintings, but in this instance it is used to underline St John’s message, and the gesture of the raised finger found so often in Leonardo’s paintings. This tenderness within the “wildness” of St John uncovers the balm-like forgiveness of sins and cleansing in baptism that accompanied St John’s fiery words. John was 28 years old when he began to preach and prepare the people for the working of Christ on the earth. He was a mighty man and preached so powerfully, his very words were indeed like flames of fire, and hundreds of people came to hear him and changed their way of life because of his words. He baptised by emersion in water and through this people had a threshold experience and became aware of the spiritual world, and also of their own failings and fall from that world. So it was that according to the Gospels they confessed their sins after the Baptism. Then they were open to the newness that was coming into the world through Christ. All sorts of people came to John, including Roman soldiers and outcasts from Jewish society. Jesus himself was baptised by John but at His Baptism, the heavens split open and the voice of the Father God was heard, and then there began the Divine deeds that Christ was to fulfil for the earth and humanity – three years of ministry leading up to Christ’s death and resurrection. John’s message to the people was to repent or radically change their thinking and outlook. He proclaimed that they should look beyond themselves and develop a social conscience. He encouraged them to overcome their prejudices and fixed thoughts from the past and to be open to see what is new and, above all, to recognise Christ, the Light of the World. An attitude to life that was appropriate in the past was no longer valid. The new had to be grasped. The coming of Christ brought about a new awareness of our destiny. This heaven-pointing St John of Leonardo da Vinci reminds us of the need to change and receive what newness Christ brings. But what of the full-length St John with Attributes of Bacchus? What can this painting reveal about John? Bacchus is the Roman version of Dionysus – the name is a corruption of Iacchus, an epithet given to Dionysus, for his rowdiness (from the Greek iache, a shout) – and like Dionysus, he is more than the god of wine and revelry: he is an archaic principle of generative nature. John’s shouts in the wilderness seem to be a possible first link to Bacchus. St John in the Desert is first documented in the French royal collection at Fontainebleau in 1625. It is described in early Fontainebleau catalogues as “St Jean au desert”, but in the 1695 catalogue this title is crossed out and substituted with “Baccus dans un paysage”. This was because of the Bacchic attributed – the panther-skin, the crown of vine leaves, the grapes, and the Bacchic staff or thyrsus, formed from the Baptist’s cross. The modulation between the Baptist and the Bacchus was perhaps part of the original conception of Leonardo. There are other hints of pagan gods in the painting. For example, the cross he rests in the crook of his left arm is entwined at the tip with a snake, and thus becomes an allusion to the caduceus of Mercury. Mercury, the messenger or herald of the gods, is a parallel to St John the Baptist, who was sent to “prepare … the way of the Lord”, and can also be related to that other messenger, the angel Gabriel. So here Leonardo brings together many figures – Angel, Baptist, Bacchus, Mercury: all messengers of the spirit-world, of new life quickening in the midst of sickness and death. “Who is it who rekindles this flame which is always dying?” St John is the great messenger of light. It is this message that we remember at this time and that lives in us at St Johntide. May the great messenger’s message be ever real in our hearts – that Christ may be recognised and our lives ready for the newness He brings. It was on Whitsun Sunday that we found ourselves in a beautiful circle at Church: a circle of children, a circle of parents, nested around a circle of twelve candles set lovingly upon a circular table. Who, I wondered, as we entered this precious space, had created this magical tableau? It was our very own very talented and dear Frances Higgins. There she sat, flute on one side of her, and Mags Meyburgh (all dressed in white), on her other side. Before her perched Frances’ music sheets. And, at the ready, a glorious story of King Arthur, his half-brother and an auspicious sword. A story she told in a way to delight boy children, girl children and parents equally. After which our big and little voices joined in singing together “In the Quest of the Holy Grail”. I sat in awe and wonder and deep gratitude to a young mother of four young ones, who had made space within her own life’s commitments to do this all for us. As I watched her, I wanted to find myself reflected in her talents and offerings. My Soul in Our Soul, a blessed place indeed Community can be, when we are open to its gifts! Each child in turn lit 1 of the 12 candles, then gently hung a beautiful paper dove above on a circular mobile. 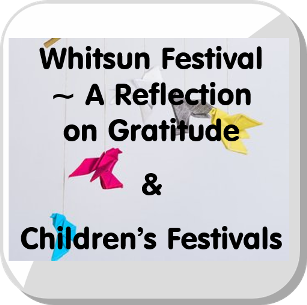 Done quietly and reverently, as soft flute music hung between us, almost as a gossamer thread intertwining us, our lives, our stories, and what brought us together in sharing this Event; Community, in Whitsun Sunday Festival. A shared vision of what we hold dear and sacred for ourselves and that of our children. Once the heat rising from the candles set the doves in flight, it was time for sweet treats in the church garden. We nibbled and chatted quietly at first, and then as children would have it, a small branch from a tree, fallen, turned into a sword and off they were in play. The sediments of the Festival Event left to simmer and percolate in their Souls. And I was a happy mum, and a grateful mum, and humble member of our Community, grateful to the souls like Frances and Mags, for the mirroring of the person in community, and community in each person. During the Christian Festive Year you will notice that there are also special festivals created for the young children. Christianity, one can truly say, is inherently a festive impulse. We celebrate one festival after the other throughout the year from Advent onwards, every Sunday is a festive strengthening beginning to the week, and even every day of the week eventually takes on a specific quality of festivity. To realise our humanity lifts the soul and infuses it with health and joy. These are the qualities of childhood. For children every day is a special event. 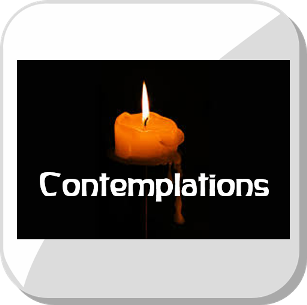 When we deepen these qualities into reverence and stillness, we anchor them in the soul. Festivals become the reservoirs we draw health, strength and joy from, which sustain us throughout our life. The children’s festivals are created anew for a period of time. Every adult is welcome and even a needed presence at these simple and deeply symbolic festivals. Eva Knausenberger presented a workshop over the three days of Whitsun that dealt with the healing power of the spirit. Healing presupposes a wound. Most people have experienced a physical wound or carry a deep-seated wound within their souls. Being wounded in some way, one could say, is part of being human. However, how we deal with wounds is becoming more relevant and urgent in these modern times. A wound, whether physical or psychological, interrupts the flow of normal life forces. Two things happen simultaneously around a wound. Healing forces are called forth that supersede normal life forces. These forces (of which we are unaware) kick start the healing process. At the same time, the wound attracts adverse forces. In the case of a physical wounding these forces manifest as bacteria, infections or viruses, say. Previously, the outcome of the battle between these forces was more or less predictable. The good would endure and the body would heal itself. But, according to Eva, we now live in a time where negative forces are gaining the upper hand as can be witnessed in pollution, worldwide epidemics and the relentless attack on the body’s immune system. Likewise, human beings are becoming more and more beset with the adverse forces that clot around our psychological wounds. These forces also operate predominantly on an unconscious level because we lack the courage to engage with our wounding in the right way. We know the symptoms of these negative forces all too well. They show up as denial, blame, excuses, revenge, anger, accusation, false expectations, pretension, aversion and addiction. Dr. Steiner pointed out that to wound someone is really to wound ourselves. When we wound the other, we will experience the pain it caused after death. The first step in healing is to own the wound. It is my wound. Through this we become conscious of ourselves and the need to do something about it. We then have a choice in what way we want to act or react. Taken positively, the wound can wake us up to our better selves and ultimately lift us up to the I AM morality. The Healing Spirit is still present, but now asks of us to be an active participant in the healing process. But how to do this? 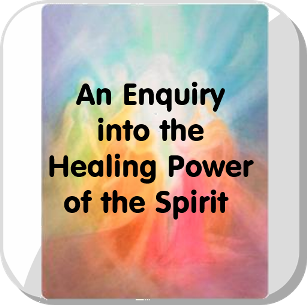 This is the question asked in Luke 10 where a lawyer asks Christ how he can access the Healing Spirit (Eternal Life)? Christ’s answer is Love. Love God and your neighbour as you love yourself. The question of who my neighbour is, is then clarified in the parable of the Good Samaritan, a person who had compassion for the wound of the other. This was followed up with a deed. To be present, attentive, kind and helpful with whatever recourse is available, to God, to the other, to oneself. In conclusion, Eva led us into a moral imagination exercise where we had to imagine being stuck in traffic, angry and resentful. Is it possible, she asked, to imagine yourself looking from another perspective, as if from across the threshold like the angels do? Then, imagine yourself as the guardian angel of the driver in front of you. Could you reach out and take responsibility for his wellbeing? This exercise might not change anything in the material world, but it helped us to realise how our attitudes can have a healing or destructive quality. Such an imagination changes the feeling inside of us. This is healing spirit at work and points to a path of how we can further human development. The Christian Community is a church that is true to the second ideal. For this reason, The Christian Community is a church of the individual and not so much a family church. Each individual decides for him or herself whether they connect with The Christian Community, it cannot be a family decision. If the message of the angels is not taken up by humanity it becomes a negative and destructive force within humanity. The development of robots to care for children, the sick and the elderly – a loss of love provided in favour of efficiency. Illness in people resulting from poverty. Addiction to the internet and social media. We see the negative effect of religious freedom for the soul in religious fanaticism and taking other people’s lives with our own in suicide attacks. We see the negative effect of not turning to Spiritual Science in people seeking to enter the spiritual world through ‘other’ ways. Christ said: “I Am the Door to the sheep fold, anyone who does not enter by the door is a thief”. People seek to enter ‘the sheep fold’ over the wall or through a hole by, for example, taking drugs. There are many paths into the spiritual worlds but only the path that leads through the Door is the correct path for humanity since the Resurrection. 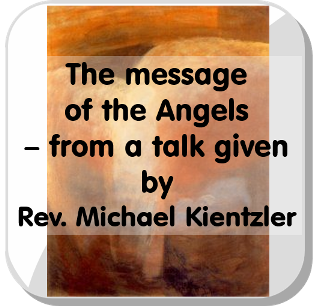 How can we heed the message from the angels? In the social realm we can attempt to form a moral after-image. An after-image is something we experience seeing when we look at a white square, for example, for a while and then turn our gaze to a red wall. We still see the white square as an after-image against the red. When we meet someone we can form a moral after-image by developing a real interest in that person. We set aside our judgements and prejudices in favour of really understanding the other person. We can learn to understand other religions. We can develop the ability to see the Divine in other people irrespective of their religion. We can learn to overcome materialism by developing a goetheanistic interest in the realm of nature. Ask a stone, plant or animal: “who are you” and find how it answers through its form, aspect, colour and relationship to its surroundings. A plant that has round leaves – leaves with an almost perfect geometrical form – tells us that the plant ‘is resting in itself’. 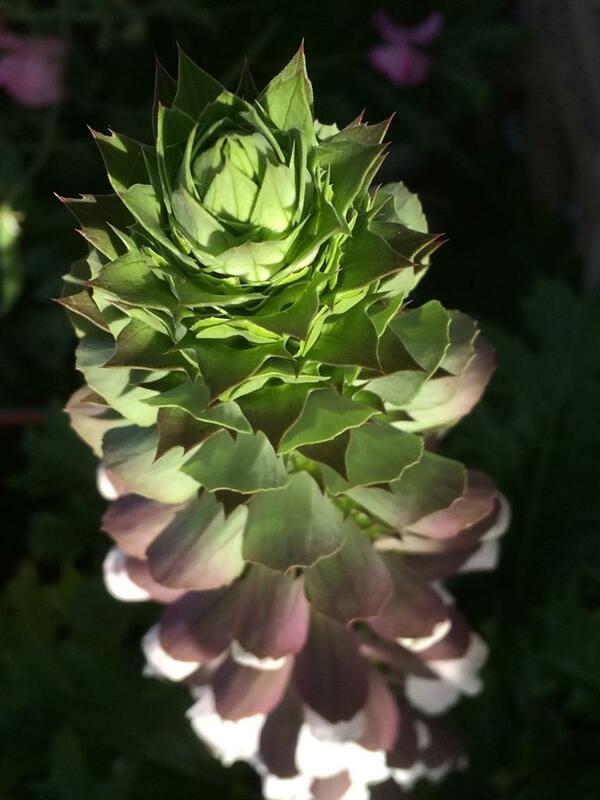 A plant with finely differentiated leaves tells us that it interacts with light. Look at the water lily, the lotus flower: it has perfectly round leaves that float on the water and a flower that breaks through the surface of the water where it flowers for three days and nights, closing up at dusk and opening at dawn. Study the flower and we see a perfect metamorphism from the sepals into the petals into the stamen and finally into the stigma. The waterlily expresses the human soul quality of devotion – it is a picture of the door into the spiritual world. Is it any surprise that human chakras are called lotus flowers (water lilies being the European lotus)? This is the true form of the chakras in the etheric realm. ​We can develop a different relationship to nature as a way of developing a conscious relationship to the realm of the angels and spiritual worlds. So begins one of the best-known stories in the world. By what happened the human race is affected in its very depth, not one of us is not concerned in it. The writer of Genesis only gives it six verses, under two hundred words. The tempter is represented in the form of a serpent. Serpents did figure in many early myths, legends and religions. Babylon’s god, Ea, was often pictures with a serpent’s head. Egypt’s Atum (in one story) was to become a serpent at the end when all else had gone out of existence. In Canaan, a serpent was the symbol of the healing god; his healing implement was a rod with a serpent turned round it. In early myths and religious legends serpents did not act as tempters, but as defenders of things or places which were especially sacred or gave power beyond the human measure. The temptation of Eve in the Genesis story was to seek satisfaction in an experience outside of her essential self, to taste the fruit that would take her out of her inner experience and one that would disturb human relationships from then onwards. With this story the serpent tempts Eve to eat of the fruit of the Tree of Knowledge of Good and Evil. In this way humanity grabs the power of discernment prematurely. The proper evolution of humanity is disturbed. In pointing to Christ as the Lamb of God, John was identifying the self-offering and sacrificial nature of Christ’s essential self. The gift of Christ to us is for us also to be like the lamb – able to give of ourselves and oppose the self-centeredness of the serpent. This Christian quality of empathy and concern for others is the practical demonstration of love. As part of lectures Steiner gave in November 1909 which were collected into a small booklet – Deeper Secrets of Human History in the Light of the Gospel of St Matthew, he explains how before the baptisms of John in the River Jordan the formation of the etheric body of human beings looked serpent-like. This could be correlated to the image of the rising kundalini in the practice of yoga: two intertwining ‘serpents’ of rising energy. In John’s Baptism of Jesus the etheric body could now be seen by initiates under the image of the Lamb. 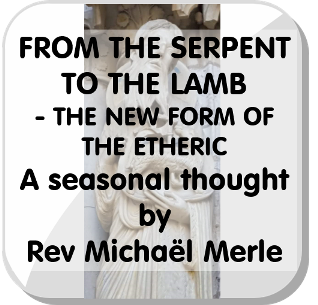 This formation of the etheric body as the Lamb could not arise out of man’s old serpent-like etheric body. It was to be the gift of Christ made manifest in Jesus. The fundamental feature of the etheric world is the inter-relationship of all its parts, and the capacity of the soul to experience itself in other souls and to receive them into its own experience. This is the etheric expression of man’s true nature. In the physical world, it is realised in sacrifice and self-offering of which the Lamb is the symbol. In the middle of last year, my oldest daughter had only traversed a few months out of her 12th year on this Earth! ... And then a beautiful journey began, for her, seven other girls, a boy and a special Priest. 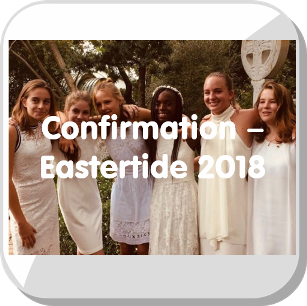 Every Tuesday afternoon they came together to embark on the special process of Confirmation. For the most part it was a great mystery as the parent, what was discussed and learnt in these hallowed Lessons. A weaving of their, as yet, short Biographies into their only just forming World Views. Adolescence is such a precious time and threshold for these aspects: looking back onto and gazing forward into. But on one occasion my daughter and her friend were laughing so animatedly, that I just had to ask, what was so funny? Their reply, when they could talk through their tears was: “Reingard is teaching us new maths: 1+1=3, giggle giggle giggle”. “Oh, how wonderful,” I said, “and how did this appear, was it the Trinity?” “No through colour; when 2 colours are mixed it makes 3, hee hee hee.” I thought this delightful and full of good sense, albeit a spiritual one. Needless to say, there was quite a bit of joking round about the process, as one does at that age; ‘Constipation Lessons’ et al. But the bare truth of what I beheld (within the shell of the jocular), was an absolute looking forward to and fulfilment from each Tuesday or Saturday, spent with their co-confirmands and dear Reingard. For me as a mum it was like watching a flower unfolding slowly, from childhood into adolescence. And from time to time a window, too. A window that would open exquisitely and briefly; in which I had glimpses of my adult child appearing, parts of the person I would be sending out into the world one day. What an honour and awe-bringing those glimpses were. 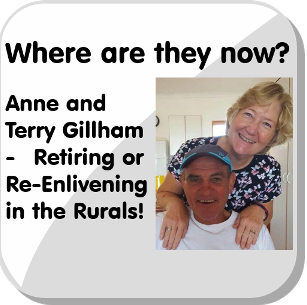 The year’s lessons with Reingard culminated in a ‘time out of time’ Confirmation Camp with her at the lovely Goodlands Estate where much inner & outer work was done. In preparation for the final week of Passion-tide, leading up through Holy Week to the Confirmation on the Easter Monday. It was thrilling and exuberating as we reached the momentous occasion. 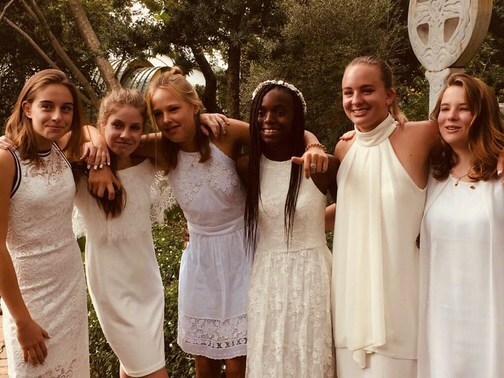 To see all these precious young people all adorned in elegant white. The tears were rolling. This was my second major ‘empty nest’ transition event. There are now more years behind my darling’s childhood than there are before her. And I know from this Confirmation journey and other milestones within the gift of The Christian Community, that my child will be kind to the Earth and find her foothold, strongly in the World. And it will be a better place, with her in it. On Sunday, 15th April Rev. Michael Kientzler gave a talk on “Guardian Angels and their connection to us”. He began by looking into prayer. When the disciples asked Jesus to teach them to pray He taught them a prayer that makes it clear that when we pray to the Father God we pray as a member of humanity, for all of humanity. Whenever we pray for our own needs: for clarity or for health, we are praying to a being who is tasked with our care. This is our guardian angel. C.G. Harrison, an Anglo Catholic occultist, wrote in 1893 that Christianity should include polytheism again as it had in earlier centuries, meaning the knowledge of the angelic hierarchies. We need to change our idea of God. The hierarchies of angels exist because of the Godhead. The word “angel” means messenger, a messenger of God. It is the simplistic image of God that results in people no longer believing in a god. When we are able to fully imagine the angelic hierarchies, we can direct our prayers to the correct spiritual beings. Angels are not the only messengers who come to humanity. A new-born child comes as a messenger from the spiritual worlds. In The Christian Community we acknowledge this fact in the baptism service when the priest says “this soul, sent down from the realm of spirit” and we respond to the message of the messenger by: “we will receive this soul”. 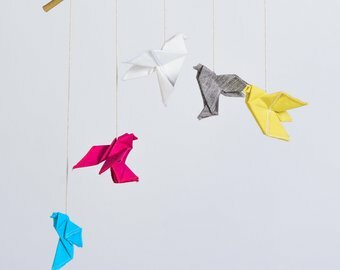 How should we imagine an angel? The first words an angel speaks when encountered by a human being is: “fear not”. The encounter with an angel is an awe-inspiring and fear-inspiring event. In western medieval art angels were depicted as beautiful, non-gender, human-like entities. In the British Museum there are depictions of angels from ancient Assyrian art as stern, bearded men wielding immense power. Neither is a realistic depiction of angels. In another talk one of our priests said that the encounter with one’s guardian angel would be so profound that unless one was prepared, one could believe that the encounter was with the Risen One. This would result in the mistaken worship of one’s guardian angel as the Christ. How do the angels differ from us? We are in the 5th Post Atlantean Epoch in which we are developing our Consciousness Soul. The Consciousness Soul provides us with the ability to recognise what is truth and to know what is the right thing to do. More often than not we find that we can’t do what is right even when we know it is the right thing to do. The next stage of our evolution is the development of Spirit Self. This is when knowing and doing are the same. This is the lowest level of the consciousness of angels. Angels reached this level of evolution at the beginning of the Earth Epoch for humanity. Our relationship to our guardian angel has changed with time. 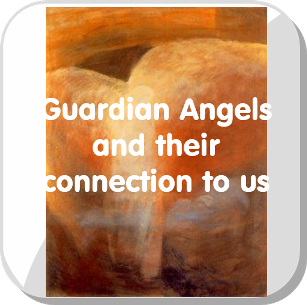 Even today a child is aware of a guardian angel, but as adults we can completely disconnect from our guardian angel. We can become like a black hole for our guardian angel. The parable of the Foolish Maidens warns us what will happen when we become ‘dark’ for the spiritual world. The foolish maidens allowed their lamps to go out and when the bridegroom arrives they have to go to the merchants to buy oil. When they then knock on the door the master of the feast does not recognise them. If we allow our light to go out we will no longer be recognised by the spiritual world when we ‘come knocking at the gates of heaven’ after death. Think thoughts of a spiritual nature, especially before going to sleep. Develop a real interest in the other person. Find the Divine in everyone with no prejudice for their religion or culture. Overcome materialism by developing a sense of wonder for the natural world and learn to see the working of the spiritual worlds in all of nature. 'Day of the Dead' Charcoal for the Anthroposophical Society festival, telling the story of death and the souls entrance into the realms of soul and spirit life... with all the attending angels and heavenly beings. In a conversation Rev. Michael Kientzler said that killing oneself as the result of a mental condition was the lethal end to an illness and not suicide. This sparked a request for him to provide more information on the subject. On Thursday, 12th April Michael led a conversation on the topic. He made it clear that death by one’s own hand needs to be viewed with care. Our perspective is not the important one. It is the perspective of the world of spirit that matters and how we will be received into the spiritual worlds after death. 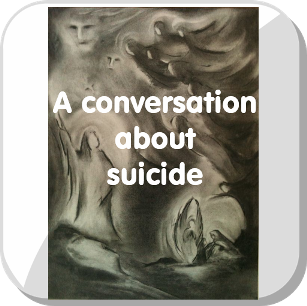 There is an epidemic of suicides in the world currently as a result of people feeling despair over some aspect of their lives. In South Korea young people who feel that their study results are inadequate take their own lives. Similarly, matters of dignity or self-respect result in many suicides in Japan. When a person is totally free (from within as well as outside themselves/circumstances) in their choice and the death is immediate, it can possibly be considered to be a case of suicide, but even so it is best to leave that judgement to the spiritual worlds since we don’t know the full karmic circumstances of the individual. In the cases where there is no outer reason for despair, but rather an inner or organic reason, such as clinical depression or schizophrenia, then death by one’s own hand can be the lethal end of this illness and not suicide. It would be similar to a patient dying of cancer. It is also worth noting that when someone intends to commit suicide and fails to die but rather injures themselves and the injuries are so severe that they die, this is not suicide. Even when death from injury occurs as little as ten minutes later. Dr Rudolf Steiner investigated several suicides and found that the reasons for these acts were to create a karmic balance for this person. Rudolf Franz Karl Joseph, Crown Prince of Austria, the only son of Emperor Franz Joseph I and Elisabeth of Bavaria, heir apparent to the throne of Austria-Hungary died in a suicide pact with his mistress, Baroness Mary Vetsera, in 1831. Rudolf Steiner discovered that Crown Prince Rudolf has lived as the Emperor Nero and that his life as Crown Prince Rudolf attempted to balance the deaths caused by Nero. A Dominican monk by the name of Thomas Campanella was incarcerated in chains in Italy for 25 years. Because those years were ‘wasted’ he was granted an ‘additional’ incarnation. In the 19th century he lived a life in which he was an author and wrote a work on misogyny. He killed himself in Beethoven’s room. This death was a karmic balance for the ‘additional’ incarnation. A Dutch doctor who was present at an ‘assisted suicide’ had a clairvoyant vision of the etheric body of the dying person shattering in the moment of death as a result of the drugs that were used. As the etheric body is the memory body, the shattering of the etheric body results in the shattering of all memory of the life and the ego consciousness of the life that has just ended. This has dire consequences for the soul in kamaloka where the soul progresses through life in reverse order to experience the consequences of the life. We put animals out of their suffering through euthanasia. This is a merciful thing to do for an animal as it has no individual karma. Yet, for a human being with an individual karma, pain and suffering are a part of inner development. People in pain or suffering should be supported in the transformation of the pain through inner development. Suicide, by one’s own hand or through the assistance of medical professionals, to end this pain or suffering is not beneficial to the individual, even though it is likely that every soul will commit suicide in one incarnation as it is likely that every soul will experience one incarnations as a special-needs person. When we die the various systems of our body fall apart and the brain is one of the last to die. A person who is brain-dead can still be resuscitated, especially if the brain has continued to receive blood. This is important to bear in mind when we consider organ donation. The person must be clinically alive for the organs to be harvested. Therefore, death as a result of the removal of the organs is not a normal death and will carry karmic consequences. The death of a foetus through abortion also has a karmic consequence. In that situation it may be the doctor performing the abortion who carries the karmic consequence rather than the woman who carried the foetus, who may not be free in her decision making. Jihadi fighters who commit suicide with the aim of killing others and someone like the pilot who committed suicide by crashing a plane with other people onboard into a mountain in the Swiss Alps, like soldiers in war, incarnate again quickly. They do not have time to ‘digest’ their past lives properly and dive into a new life quickly, often with the people with whom they were intimately connected in their deaths. Those who die innocently in situations of mass death often find a mutual task to work on together in the future for the good of humankind. When someone dies suddenly the sudden loss of the body results in extreme withdrawal symptoms, not unlike, but more severe, than the phantom pain suffered by someone who has lost a limb through amputation. Those who remain behind, who are connected to the person who dies suddenly, can assist the person through this loss of the body. We must also bear in mind that the divine guiding beings work to create positive outcomes in our karma. Since the 20th century the Christ has become the Lord of Karma and the whole of human karma has become something positive. 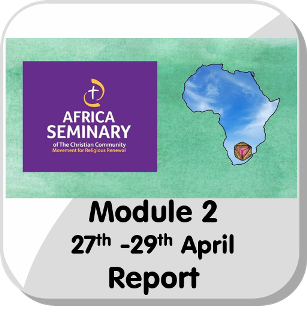 At his last lecture for the community on Sunday, 22nd April, we discovered that Rev. Michael Kientzler was also a beekeeper for several years. He spoke about his experiences and discoveries in living with the bee colony. These were some of the insights that he shared: There are two beings on earth which show us archetypal behaviour which human beings strive to achieve as a future ideal: cows and bees give much, much more than they take. The worker bee gathers and brings the pollen into the hive and immediately gives it away, keeping only a minute bit for itself. Each bee receives and also immediately passes it on and in passing on will add certain enzymes, thereby bringing about a transformation in the substance, and in this process of passing on Honey is created. One teaspoon of honey is created by more than 1000 bees. Honey is an incredibly precious substance. Honey is a remedy, is medicine, not food. This act of passing on shows us what sisterly behaviour is, shows us the principle of the healthy economic sphere. Human society can learn a lot from the bees as a Super-Organism of wisdom and love. They practice a horizontal hierarchy, unselfish giving and sharing, giving everything - even their life - for the wellbeing of the whole, the queen bee is not ‘the boss’, but fulfils a specific need for the whole, as does each bee. In the beehive we can learn how the individual creates and serves the whole community; the Colony, the hive colony itself is a Being and has an immune system which manifests in the warmth-fragrance specific to each hive. The hive colony is a place of social harmony, profound wisdom and selfless love. 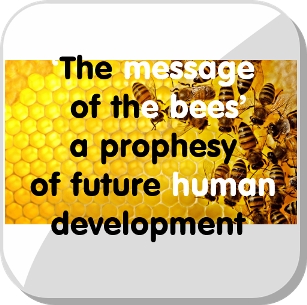 Today humans have disturbed this harmonious order through intentions of personal gain and greed to the extent that bee colonies are dramatically threatened in their existence. Research shows that long ago bees were bred parallel to the process of humanisation. So, one could say, they hold the image Ideal of social order in one level of existence for what humanity seeks to reach in the far future on a higher level of existence. We can try and incorporate the bee virtue into our lives: give more than we take. We can try it in one place, with plants, animals, humans, everywhere it is possible: look with genuine interest: ‘who are you?’ Even a plant or stone can speak, they speak through form, shape, behaviour, colour and so on. Every being is unique, every being on earth wants to be seen and taken seriously. Everyone. We all need to become ‘seeing’ in this way. With this approach we give something back. Bees have a lot to teach us. The biographical ages of a human being have an inner connection to the Christian festivals. The Festivals themselves are the expression of specific events and deeds in the life of Jesus Christ. These can be actualised among us even today. The archetype of our humanity took on form and individuality in Jesus Christ and can therefore give us a guiding image for our individual biography. The Child in the crib at Christmas, beginning its life as every human being between angel and animal, ‘over-shone’ by a heavenly glow, speaks to every birth. The child then embarks on its way to 'be, grow and become’ under the guidance of dear people in its life, who are mediators of the higher moral values, to follow like a shining star. As the child comes into its fourteenth year, the experience of leaving childhood behind, of a kind of loss of paradise, can find a resonance within Passion-tide. Now the own actual journey on earth begins with questions, searching, doubt, loneliness, sadness, deep longing for independence and knowledge, for acceptance and understanding and with the goal to experience and grasp oneself as the unique ‘I’. “Confirmare” is a Latin word and means: to secure, to strengthen, to acknowledge, to make firm; to encourage spiritually, to secure firmly in faithfulness. The Sacrament for the transition from childhood to youth indicates already by its name ‘Confirmation’, that its focus is to strengthen, make firm, acknowledge, enliven and renew something which is already in the child and wants to be nourished to live and grow, so that the child finds the power to become what it has set itself as a life goal from before birth. It is of utmost importance for the youth to experience the positive support and encouragement of the Community at this moment. It is with and through the Community present that the Christ-Blessing is able to be gifted to the confirmands. Your presence at this very special sacrament is highly appreciated. To clarify: this talk was about depression of the every-day (angst) for which a cause can be found in our lives, not clinical (endogenous) depression which is a physiological disease requiring medical treatment. Life-angst, taken from German, refers to a non-specific anxiety or dread as opposed to fear which is usually specific, e.g. fear of heights, fear of dogs, etc. A general sense of depression is common today, Many different studies identify various countries among the top 10 for most depressed people, based on the prescription of anti-depressants. Iceland and the USA and Canada are often cited at the top of lists but Portugal is often placed in the top 3. Clearly there are many factors causing depression and not just the first obvious one being a lack of sunlight. Depression is connected with our modern life-style. We can say this because in Germany, during World War II when life was in survival-mode (also in London during the Blitz), mental/psychological illnesses were at an all-time low. it may be that a struggle to survive lifts one out of a general angst. How can we understand depression a little better? Depression is the experience of being pressed down; of experiencing the weight of physical existence. Depression can be experienced only in a physical body. Michael had close contact in his practical year working in a psychiatric hospital (as opposed to working in a church congregation) with those who suffered from a bipolar diagnosis. He observed that with depression patients often had great clarity about their illness during periods of depression but lacked the will-forces to get out of bed and do the basics required of life. But during manic periods, the patients had an over-abundance of will-forces and some had to be restrained, but they had no insight or clarity on what they were actually doing. Depression takes us into ourselves; it can be described as our self-perception being over-exposed. We become oblivious of the world and people around us. Our will-forces also become depressed. Life-angst is a little different. It reflects a lack of faith, the kind of faith that we see in infants and toddlers. A baby abandons itself into the arms of an adult with complete faith. As an adult we know the risk of dropping something we hold, but the baby is oblivious to this risk. This level of faith is the result of the care the spirit experiences in the world before birth. We begin to experience life-angst when our absolute faith is shaken: we burn ourselves in a candle flame, trip and fall, or our parents divorce. The polar opposite of life-angst is reckless or fearless abandon. The antithesis of life-angst is carefulness and the antithesis of reckless abandon is courage. The middle ground between two negative polar opposites is the positive expression of life. 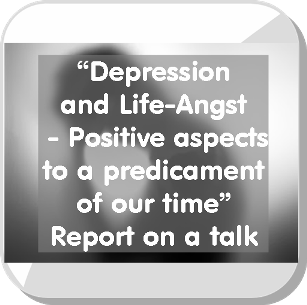 How can we overcome life-angst and depression? 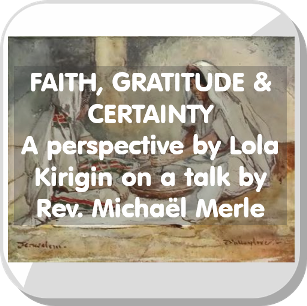 Overcoming life-angst requires building a new faith, a conscious faith. One way is to study the cosmic wisdom reflected in nature. 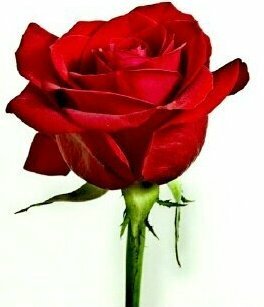 Study a rose and discover that the 6th petal overlaps the 1stand the sepals below form a pentagram. The five-fold nature of the rose is preserved in the entire corolla (petals) of the flower. We see the first petal is partially green; a metamorphosis of the sepals. When we question the nature of the rose it responds that we should handle it with care: “Don’t touch me” it seems to say. These too were the words of the Risen One to Mary Magdalene when she came alone to the tomb. The rose is a projection in form of what lives in us as love. When we study the orbit of Venus around to sun as seen from earth it’s path traces a pentagram. This relates Venus to the rose and to love. In nature we see Cosmic Wisdom reflected everywhere and an appreciation of being surrounded and enveloped in Cosmic Wisdom can give us a conscious faith in life on earth. Depression asks that we abandon our self-interest and focus our interest on other people and the world at large. There is also a homeopathic-like remedy for depression, adding a ‘dose’ of conscious depression. In Passiontide we are asked to objectively reflect on the suffering of Christ, a suffering that is probably worse now, in this age of rampant materialism. We are asked to develop empathy with the Christ. This reflection on an objective depression year after year heals the soul of subjective depression – being pressed down by life. Passiontide is followed by Easter, an objective joy. Passiontide and Easter are a schooling for the soul, with time. The incarnation of the Christ in the body of Jesus of Nazareth at the Baptism by John in the Jordan meant that at Golgotha the rite of Initiation was fully realised – and now it is possible for us as human beings to live in the reality of this Resurrection and so to know the secrets of the spiritual world. It is this great mystery of the Mother and the Son that we see enacted in the interchange of the Wedding at Cana, and again in the words spoken from the cross: “Woman, see this is your Son; Son see this is your Mother”. At Whitsun the Holy Spirit descends into the very constitution of the human being, so that the human being embodies the Spirit. The disciples saw this Spirit as a tongue of fire upon the heads of those gathered. This life-giving fire permeates the human constitution and like a mother gives birth to the Christ in us. Our I-organisation body is a Christ in-dwelling in earthly man. It is the task of this “I” in us (Christ in us) to transubstantiate our early body into a Spiritual body, to make real in us the Resurrection of the Christ. 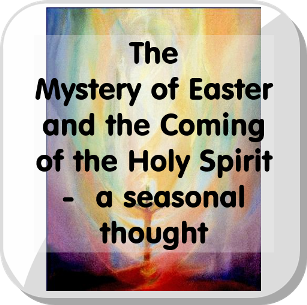 The development of the greeting; “Dominus Vobiscum” (The Lord be with You) to “Christ in You” recognises the great Mystery of Easter at work in the Spirit-filled human being. This recognition is deepened through the words: “Christ in us” which is spoken twice on two separate occasions in The Act of Consecration of Man. Here new insights into the secrets of the Spiritual World can be meditated. 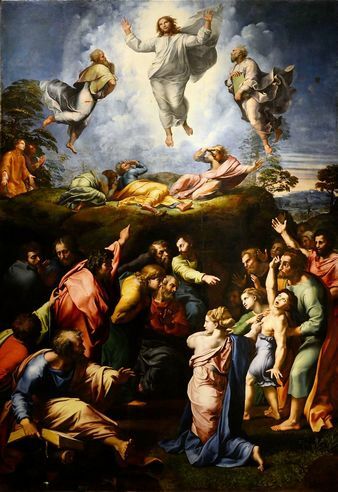 The final Sunday Gospel reading before Passiontide (on the Second Sunday after Shrove Tuesday) combines the beautiful and radiant picture of transfiguration with the healing of a young boy torn about (described as falling into water and falling into fire). This young boy is also described as "moonstruck" or a lunatic - in other words, not operating from his reason (as a healthy human being would) but crazed, as if held by the moon and not by the sun. What can it mean to fall into something? Could it be that the boy is simply unable to prevent himself from harm, potentially exposing himself to burns or drowning? Might we see this falling as an attempt to find solace and healing in the elements that represent the two different kinds of baptism: water and fire? Baptism means plunging and the baptisms of John in the Jordan would have involved full immersion into the waters of the river. There one experienced a threshold of death to be reborn upon rising out of the water. This baptism is the baptism of old that required the experience of death (as did the initiations in the ancient mysteries that required a three day temple sleep). In Christ we have all been carried through death to new birth. Paul describes it so in his letter to the Romans: "... as Christ was awakened from death by the light-glory of the Father, so we, too, walk on our further ways with renewed powers of life ... If we have died with Christ, then our faith lets us share in his life" (Romans 6: 4,8). Our Baptism is no longer one of submersion in water but rather one of a Baptism in the Fire of the Spirit. John points to this very significant shift when he says: "I baptise you with water: but One is coming who is mightier than I, and ... He will baptise you with the Holy Spirit and with fire." (Luke 3: 16). Baptism in a truly Christian sense is to act in accordance with what has been enlightened by the Holy Spirit in the fullness of Whitsun for the human constitution which carries an incarnated "I". "... act in accordance with it, (the human constitution in a love relationship to God and neighbour) and you will find life" (Luke 10:28). 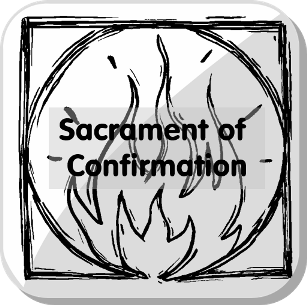 In The Christian Community the Sacrament of Baptism is not about the confession of sins and the joining of a church. The whole character of baptism has changed. It is now the spiritual completion of birth: the community becomes the womb where the child is to be spiritually conceived and borne on this side of the threshold. Now the soul is able to mature and unfold in the comfort of communion with the Christ Jesus. As adults we do not need this. We are able to draw ourselves in to relationship by acting in accordance with the new constitution of the human being - one that has the element of the Christ-I incarnated into the full being of a person. The Gospel readings in Passiontide will extend this picture. Hans-Werner Schroeder describes this as follows: "... Christ Unites himself with the darkness and the depths of human life on earth. He takes them, unites them with his own divine-human being, and wards off the death-bringing consequences of the 'sickness of sin.' The human soul need not be crushed by the load of earthly sin, when it feels united with Christ, a renewed call to a devout contemplation of the deed of Christ, the love of Christ ... Body, life and soul are touched in these events of Passion." 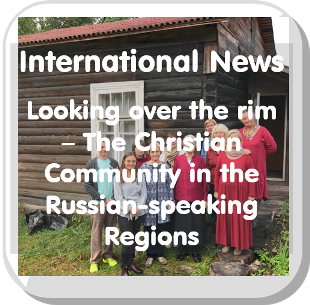 The Christian Community hosts its annual children’s camp at the end of the school year, and this has become a fixture in the lives of many children who attend it from the age of 7 to 13. Older youth and young adults are involved as coordinators and helpers, many having been children on camp themselves. This year saw 128 of us making this beautiful estate our home for 9 days, much to the surprise of some herds of buck and zebra. The 2017 Children’s Camp was held at Goodlands Estate in Tshwane and to everyone’s delight, the dam was full, unlike the previous year, providing many hours of fun in its waters. 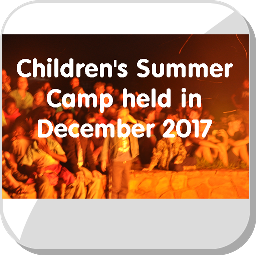 Although this year’s Camp was a shorter one than usually, it still contained many of the traditional highlights, such as The Treasure Hunt, The Goose Game, The Helper’s Play and The Christmas Dinner. On top of which, the children were given the opportunity to become Children again, due to the care taken by the Helpers to play many exciting games of Volley Ball, Ultimate Frisbee, Baseball, Dodge Ball, Open Gates, etc. This was because the usual distraction of electronic devices was not present. To quote Napoleon: “An army marches on its stomach” and the same was true here for the exceptional food provided, which was a highlight for many. The Camp could not have operated to its full potential and the children would not have been able to play, hike and complete their crafts so beautifully and happily if it was not for the tireless work of those volunteers in the kitchen. The countless friendships and memories forged will undoubtedly remain strong and true in the following years to come and be rekindled with this very special annual Camp. Thank you to all who attended and made the 2017 Christian Community Camp possible! We look at the world around us and become aware how technology is an inseparable part of our lives. I remember in 1994 sending Hendrik on a trip to Cape Town from Kimberley. We couldn’t afford a ticket, he insisted on the trip and decided to hitch-hike. Our communication was from pay-phones at filling stations along the route. Today, I go to buy coffee at the nearest shopping centre and my mother asks whether I have my mobile with me and expects a SMS text when I get to the shops. When a computer system in a retailer goes down, they cannot serve their clients. When a bank’s online system goes down it assumes the proportions of a national crisis. How will this integration of technology into our lives continue? Once we relied on the instincts of a horse to help us get around. We then moved to full reliance on our own intelligence for getting around and we kill over a million people a year globally in road related injuries. Soon we will have autonomous vehicles and we will rely entirely on artificial intelligence to get us safely to our multiple destinations. Will we incorporate an electronic chip into our brains as science fiction suggests? How far are we from regenerating our bodies to remove injury and disease completely? ​These questions prompted Rev. Tom Ravetz, editor of Perspectives, to ask for articles on this topic. The Advent 2017 to Epiphany 2018 quarterly edition reveals the thoughts of some of these authors. I was notified of an article by Rev. Peter van Breda and thought I would ask to publish it here for you to read. But on reading the rest of the publication I decided I’d share a little of what each author’s thoughts are. 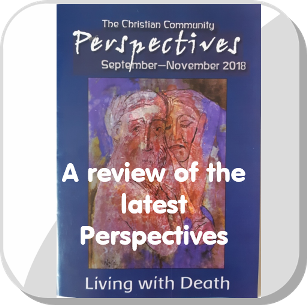 If you cannot borrow a copy to read the full articles the back issues are downloadable from the Perspectives website (find the link on our websites) and soon this issue will be available for a small donation. As Tom writes in his editorial: “when we are preparing to receive communion, we pray that Christ give us his peace so that we may ‘unite with the world’s evolving’.” Andrew Linnell, a long-standing member of the Anthroposophical Society writes in his article: “Divine Guidance prepares for evolutionary changes far in advance.” What Divine Guidance is at work in the preparation of the technological age rapidly coming towards us and how do we ‘unite with this evolving’ in a conscious and meaningful way? We all need to find our own answers, but here are some thoughts. Rev. 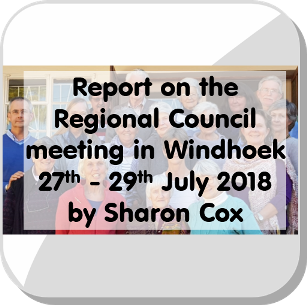 Louise Madsen (retired priest) sets the scene by ensuring that we do not forget who we are: “an idea in the mind of God … fashioned in ‘His own image’”. Within each human being is, at the spiritual core, something of God’s essential nature. Just enough “to set out on (a) path towards achieving (our) full potential as MAN in (our) own right”. However, it was soon evident that we would not achieve the goal without “help and guidance from God Himself”. 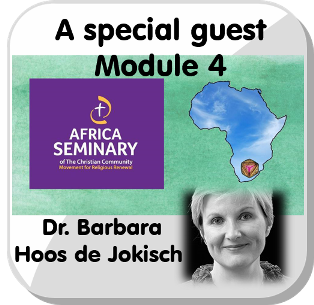 At first this guidance came from outside – through ‘the Law of Moses’. But the plan included the possibility of God entering into human existence, achieved through the physical hereditary line of Abraham in Jesus. The “entry of the Son into the world of humanity” shifted the guidance given by God to within the soul of human beings. This guidance from within is still in its fledgling stages but has the aim of seeing us take our place “close to the angels, in the realms of the new heaven and the new earth, the New Jerusalem”. Rev. 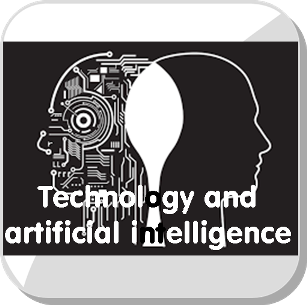 Peter van Breda says that it is quite clear that “the robotic digital age is firmly entrenched within modern society” and ponders whether “a new kind of consciousness is going to be required to manage and keep pace with this revolution”. “Our smartphones have become the repositories of the daily lives of millions of people. We have transferred a central part of our memory and consciousness into a machine that exists outside of ourselves. For many, a life without this alternative source of memory is unimaginable.” He reminds us that we use our senses – all 12 of them as described by Dr Rudolf Steiner – to “experience the outward appearance of things”. Underlying the outward appearance “is a world of living being”. Part of our mission on earth is to use our senses to “help rescue an enchanted world where only the surface reality is taken seriously”. Then Peter turns to the world of robotics where in Japan, which has the longest living population and therefore the greatest proportion of elderly citizens, developments in robotics have created a new workforce of robots to care for this geriatric population. Robots can do the daily household chores, play musical instruments, help people into and out of bed and assess the mood of their charges and adapt their conversation based on this mood. In Japan even the more physical needs of intimacy among the younger population are being replaced by robots instead of human relationships. Robotics will have a huge impact on the economic lives of people as they take over the work we once did. Driverless trucks will change the haulage industry and, as a consequence, the insurance industry. Medical robots are more accurate more often at diagnoses than medically trained people. 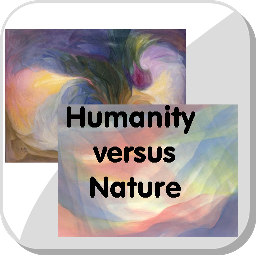 Peter feels that we must act now to retain the basic spiritual nature of mankind and ensure it is not engulfed by a purely materialistic view of life. toward us out of the future. We must acquire serenity in all feelings and sensations about the future. Are robotics and artificial intelligence the nightmare painted by movies such as The Matrix or whether, properly infused with the morality of our human consciousness, they are part of the Divinely guided future of our evolution? What the priests point to is the ever-increasing importance of the renewed sacraments in this evolutionary progress towards the future of humanity. The answer to this question is quite simple really; and yet, a real battle still awaits. The answer is to be more meaningful to society in general, notably to business and to government. So how does one achieve this? Is it achievable or is it something we must just pray or hope for? Business’s sole task is to provide for the outer needs of humanity efficiently, without waste of any kind. Waste extends to the waste of humanity and nature. Business is where value is created, either from nature and labour, or from the division of labour leading to specialisation and diversification of human contributions to the economic process. This value ends up in money as money is simply the means to exchange the various values created. 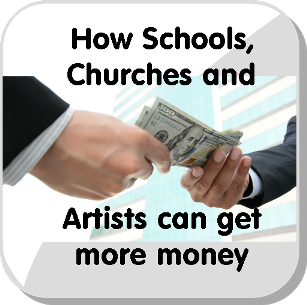 Schools, churches and artists are not involved in the economic process. They are involved with the liberty initiative. They provide for the inner needs of humanity. The thinking that churches, schools and the arts are not going to end up with money unless they are structured as businesses is a totally false goal! The reason this is a false goal is because one can never educate a person efficiently or bring God to her efficiently. People can never become commodities. No ‘process’ can be devised to bring the art within a work of art to a human soul efficiently. Efficiency relates to what can be done with the manufacture of products or the provision of service or storage of data. The very thought that human qualities can be efficiently handed over is abhorrent to any person with a sense of their humanity. To summarise then, business is the sphere where money comes from. It goes to the equality or government sphere via taxes. It needs to get to the liberty sphere via donations or gifts. This will not happen until business wants to make a gift gesture in return for better people or until government wants to get better people so that it can provide a better platform for a functioning society that can in turn generate more taxes, and so on. Why should business and government want better people? What are better people? (I refer you to various articles in the liberty section of my website www.davidwa.co.za.) I repeat here what has been said before. Dam walls, roads and bread all come from the activities of the human being. The finished product is a consequence of the idea, the plan. The action of making the product comes second through determination, skill and experience. First comes the idea. Ideas are not material things. They are spiritual. Some people have grounded ideas. Some have whacky ideas. Some ideas are practical, others simply fantastical. Then, people with patience, care, courage, positivity, openness, selflessness, objectivity, clarity, diligence and ownership of self, for some reason make a bigger contribution to any endeavour than those with the opposite capacities of soul. The opposites are haste, hate, fear, negativity, prejudice, self-interest, fantasy, laziness and blame. People with these qualities in their souls don’t add much to the end result of things in business or in government. Just take one simple example and run through it first with the constructive soul contents and then with the negative ones alive in you. The example could be the way tea is made by the tea person either in business or in the government offices. If you do this carefully within yourself, you will sense exactly what I am saying. In the first case, the person will make good tea, have a positive effect on the other staff, waste less, be able to participate and do more. The second person will have the effect of others preferring to make the tea themselves, waste, loss of cups and pots and tea, dirty cups, sour milk, disciplinary processes and so on. What is the cost of this? It is huge as we know. The annuity cost of an ineffective staff member is enormous. It is not only about the cost of the staff member but add to that the loss of morale, the negativity that spreads, the extra time and effort that it takes to improve staff morale. Further, the problem is that one cannot plug in an App to fix this. Schools, churches and the arts can have a real effect on the soul qualities that exist in people. Can they shift their attention towards this reality? Can they begin to make the link between what they offer and what lives in human souls and how important this is on the ground? Quality human souls make for better economy and better governance without doubt. If business felt this to be real, which they are slowly beginning to work out, more gift money would go to the liberty sphere. Government would also realise this and perhaps fund at least infrastructure for the liberty sphere. In time, with more funding, the liberty sphere would discover more of itself, more about the human being. More people would migrate to this sphere. It would earn its rightful place in the Threefold Social order and have the effect of strengthening this magnet and assisting the motor in turning better. More openness, care, courage, clarity and more, would be possible in more young souls that would slowly find their way into the system. Automatically there would be more small businesses, more efficiency, more moral activities, more material support for the liberty sphere. Business would directly employ more of the arts and humanities focussed people to assist them from within. If we allow or condone that the liberty sphere funds itself through economic activities, we are diverting their inherent human interest to something earthy. This is a very dangerous path for humanity to choose or drift down in laziness. To get more money, schools, churches and the arts need to find ways to show their value on the ground. Churches perhaps need to shift from serving God to serving the Godliness of humanity and God via this. Schools need to leave some content for some human development. Art needs to show what the human being is capable of if the humanity in us is served. 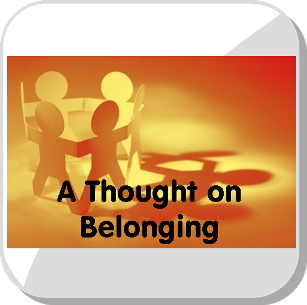 A lively discussion around the concept of “belonging” followed the reading of Aaron’s poem at the first trustee meeting of 2018 and what “belonging” entails. We agreed that belonging is not a passive thing. It is clearly a Call-to-Action, which is so beautifully encapsulated in Aaron’s poem with the word: Yes! The value that each members places on the Church of Lazarus based on the importance of The Christian Community in their lives should find expression in the contributions received by the Church of Lazarus. In the early Christian church the 6th of January was the day set aside to celebrate the great appearance or manifestation of the Christ. 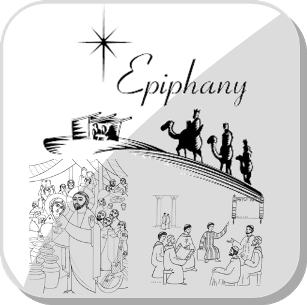 Epiphany means a moment of sudden and great revelation or realisation. The manifestation of Christ in Jesus of Nazareth, the great moment of revelation and realisation is the Baptism in the Jordan. It was this great epiphany that was first celebrated in the early Christian church – the recognition that Christ permeated the sheaths of Jesus of Nazareth. Soon after the early church began celebrating this epiphany, the celebration became associated with the revelation of the birth of Jesus, who was to be the bearer of the Christ, through the appearance of the Christmas Star which led the three great Magi to the place where the child resided with his mother. Then and now, the day (6th January) became the Three Kings Day. 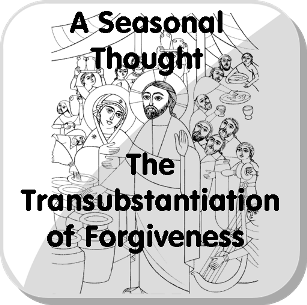 The other gospel event that was closely associated in the epiphany celebrations of 6th January was the wedding at Cana where the Christ-force within the body of Jesus shone sun-like into the water that turned into wine – thus revealing the power of the Christ-being to the disciples. What is the nature of the manifestation we are looking at during these four weeks? On 6th January and on the following Sunday: The star and the kings (Matt.2:1-12). On the second Sunday: The twelve-year-old Jesus in the Temple (Luke 2:41-52). On the third Sunday: The marriage at Cana (John 2:1-11) or the centurion at Capernaum (Matt.8:1-13). On the fourth Sunday: a healing. ​What is the meaning of this sequence? Its consecutive steps speak of a progressive incarnation, a penetration of earthly realities by the spirit. The images themselves indicate this. In Matthew 2 the star appears over the house in which the child is present; a direct image that a spiritual reality, the star, is preparing to enter an earthly dwelling. It is still shining over the body of the child which has been born, as happens with every new-born human being. The third stage of this incarnation is indicated by the wedding at Cana. Now the star reveals that it is actually a sun, and that it breaks through the person who carries it within himself, not only as wisdom and love, but also with sun-like powers of transformation. What the sun accomplishes in nature — the transformation of water into wine in the vine — Christ accomplishes by virtue of his spiritual sun-like authority within humanity, represented by the guests at the wedding. The final step is taken when a healing is read. 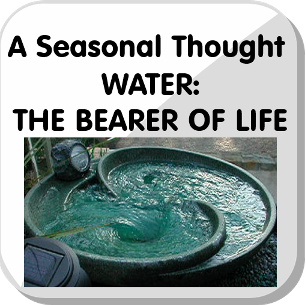 The manifestation of the spirit within the realities of earthly life (that is, the epiphany of Christ) is intensified to become a power of healing, which not only transforms that which is healthy (Cana), but is able to heal what has become sick. Why not the Baptism on 6th January? The question is often asked, why the passage about the Baptism in the Jordan is not read in connection Epiphany. 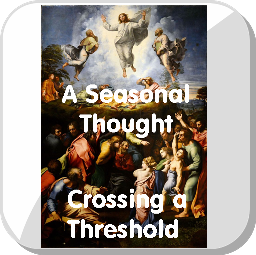 We have seen that the sequence of Epiphany readings describes a progressive incarnation. What appears in the Baptism in the Jordan as one tremendous image, the appearance of Christ from the spiritual world and his penetration of the body of Jesus, unfolds in four stages in the four Epiphany readings, thereby becoming visible as a process. With this in mind it also becomes clear why the season of Epiphany with its four steps follows the grand revelation of Christmas. What has shone over us during Christmas in luminous splendour, now wants to descend in stages in order to become earthly reality; what at Christmas was the great, merciful promise of redemption, now wants to become a real human being, and accompany us in our daily lives. Christmas can become for us more and more an elevated time of compassion and mercy. That it is possible today to add to it a further festive season of four weeks is one of the great gifts of the Christian renewal. It gives us the possibility of reflecting on our Christmas experiences, and to unite these with our daily lives. Rudolf Steiner once revealed something of the mystery of the Epiphany weeks, when he said that during this time ‘Christ walks beside us’ (Cosmic and Human Metamorphoses, lecture of 20th February 2917), and that this is the time when we can become more and more conscious of what has happened at Christmas, just as in the morning we are able to have an echo of what we experienced during sleep. In continuation of our contemplation of the four Epiphany readings, we could add: At Christmas, Christ appears as the light from the spiritual world. At Epiphany he unites himself more and more with the world of earthly realities, he incarnates, so that he is able to ‘walk beside us’ — invisible, but real; as real as he is presented in the gospels, as a human being; that is, loving, teaching, transforming, healing. December month brings us the 4 weeks of Advent followed by the 12 Days of the Christmas Season. What is the origin of the 12 days of Christmas? In his book Time and Rhythm (Urachhaus Press, Stuttgart, 1978), Wilhelm Hoerner explains the origins of the tradition of celebrating (or possibly better put: acknowledging and embracing) the 12 Holy Nights (this time that is generally known only through the carol: ‘The Twelve Days of Christmas’): "The difference between the sun and the moon years consists of...twelve days. If 6thJanuary is a new moon, then on 25th December a moon year with twelve full lunar cycles will have been completed. Then only twelve days are lacking to the completion of a full sun year. Those days were added to the 25th December by the ancient northern peoples in order to bring the moon year into agreement with the sun year. On those days, which were dedicated to the gods, no heavy work was to be done. The human being was able to experience a conscious unity with higher worlds. 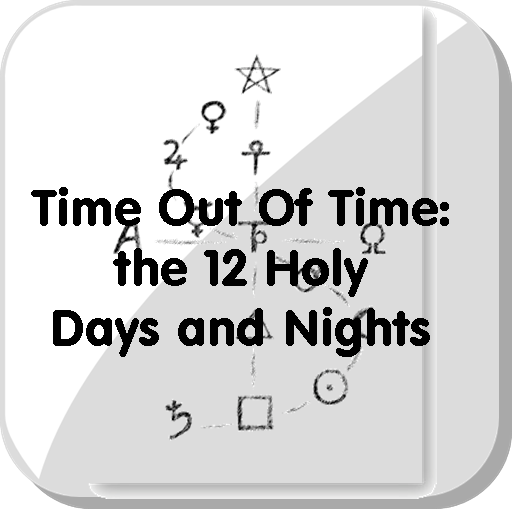 Many practices, rules and regulations still give a faint echo of these 'holy nights', of which the words 'the twelve days of Christmas' are now only a remnant. On New Year's Eve, the traditional clamour made at midnight reminds us of the noise made to drive out the demons. The twelve days were seen as prophetic for the twelve months of the coming year. Our New Year's Day falls in the middle of this time of 'holy nights'. For those wishing to live a truly conscious life, these twelve days and thirteen (including Christmas Eve) nights can become a 'time set apart', in which reflection and prayer have a special place, in a manner similar to the seven days of Holy Week." 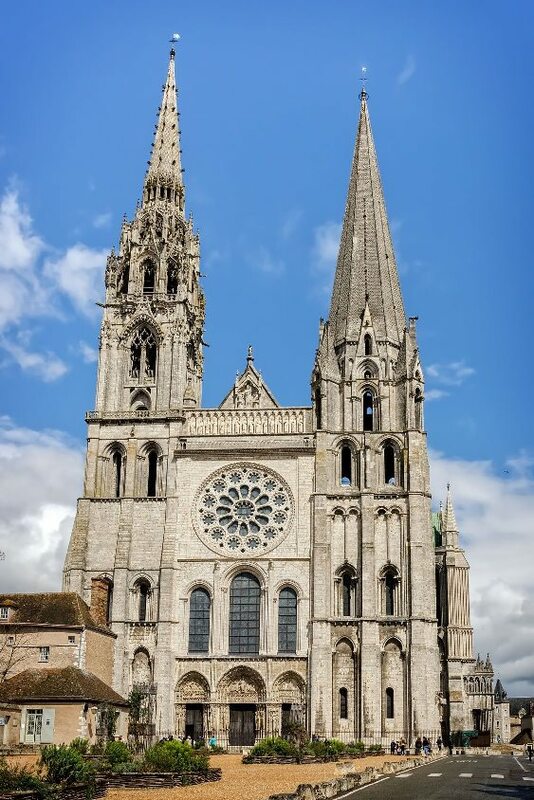 We can see this extraordinary relationship between the Sun year and the Moon year when we stop to look at the western façade of Chartres Cathedral, in the unequal heights of the left and right spires. If we measure the height of the left spire (as we face the western facade) - The Sun Spire - then we find that it is 365 feet high to its sphere (upon which sits a cross) and that this also corresponds to the full length of the church inside. The right spire - The Moon Spire - is exactly 28 feet shorter to its sphere (upon which also sits a cross) representing one full lunar month. 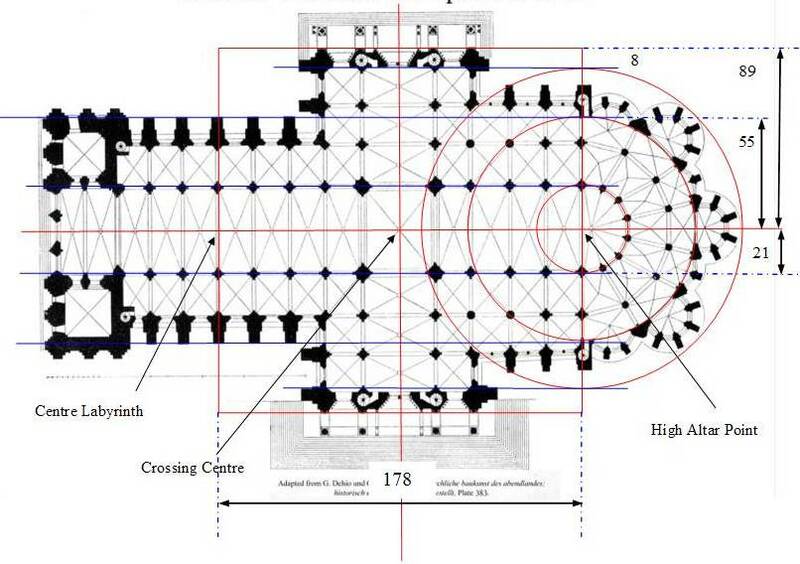 This length corresponds exactly to the geometric centre on the floor inside of the radiating points of the concluding semi-circle at the very eastern end of the cathedral. This would have been the place of the original high altar with the sacred space (between sun and moon) behind it. This sacred space represented a sacred time in the year: the time out of time of the 12 Holy Nights. ​If we are able to hold the Christmas Season in the mystery of both the mood of Advent: arrival and preparation, and the mood of hope and expectancy for the whole year ahead, then we are truly holding these 12 Days of Christmas as holy and as a time out of time. In a world that feels increasingly rushed and paced beyond what feels healthy this momentary suspension brings a very special quality to the Season of Christmas. We encounter the 12 stones twice in the bible. 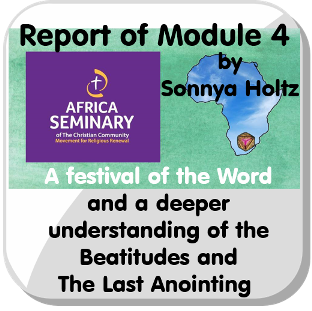 Firstly, we encounter the 12 stones in the book of Exodus chapter 28 where it is described how a breastplate shall be made for the office of the High Priest. These stones sit in four rows of three. This breastplate is the outermost garment of the High Priest and sits over the 12 petalled heart chakra. The High Priest was the representative of the Heavens on Earth and in representing this, the garments transformed him into a representation of the living earth. The outer mineral crust of the earth formed the outer garment, as the 12 stones were all silicates – the very elemental substance of the earth’s crust. 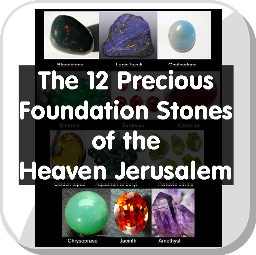 The next time we encounter these 12 stones is in the Revelation to St John chapter 21 when he describes the Heavenly Jerusalem descending. These 12 stones form the foundation of the New Jerusalem. The outer covering of the High Priest has transformed into the inner foundation of the New Jerusalem that represents the new constitution of Humanity in the next incarnation of the Earth. From being an outer reality the 12 stones become an inner reality. This will be achieved by humanity through the transformation of the 12 Virtues (that were described in our newsletters from November 2015 through October 2016) through our soul process into the 12 Spiritual Virtues. In other words the 12 Foundation Stones of the New Jerusalem are the 12 Spiritual Virtues of future Humanity at the start of the next evolution of our earth. The 12 stones are described in the Hebrew text of Exodus and in the Greek text of Revelation using terms that were understood at the time. Our study of mineralogy and gemmology has classified gems differently and identifying these 12 stones correctly has taken Michaël on a 34-year journey. His interpretation differs in some cases from other studies of these stones. 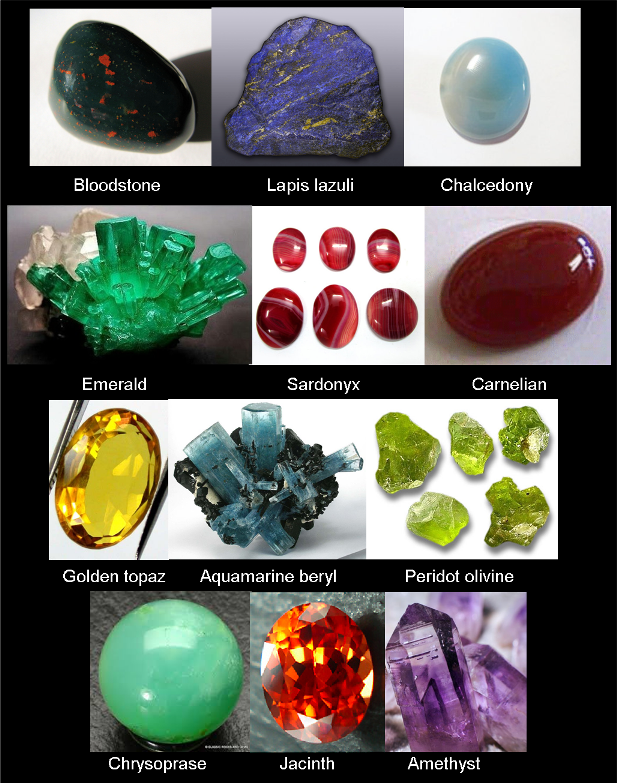 These stones are not only real gems, but they also represent qualities. It is for these qualities that these stones were selected to form part of the breastplate and the Foundation of the New Jerusalem. Rudolf Steiner indicated a connection between these stones and the Signs of the Zodiac. We know that the Zodiac plays into the lives of Humanity in a real way as we experienced in the Eurythmy movement with Christine Allsop in the previous Holy Days, and this adds to our understanding of the qualities of the 12 stones. What are these 12 stones? The outer crust of the continents consists of rocks in which silica is a prominent element. This differs from the rocks of the oceans where silica is largely absent. Silicon is element 14 on the periodic table and sits directly beneath carbon – the Philosopher’s Stone – which is element 6. Elements in the same column of the periodic table have similar properties in the way they combine with other elements. Carbon is the root element of all life and silica is the root element of all life and silica is the root element of the earth’s crust on which we walk. Silicon may be seen to mimic carbon in its structures but lacks the flexibility of carbon. They share the structure that can be described as a cubic diamond. This is worth remembering when we think of artificial intelligence, and all computers, that it mimics living intelligence but lacks the flexibility of living intelligence. Because of this connection between carbon and silicon and between the 12 stones and the 12 Virtues it would make sense that all 12 of the stones are silica-based stones. In the modern interpretation not all the stones are silicates and this is where Michaël’s personal research is so significant. Stone 2: Sappheiros in Greek means blue stone. Sapphire (contains no silica) was not known in the Mediterranean areas until late in the Roman Empire and the blue stone was likely to be the feldspar (KAlSi3O8 – NaAlSi3O8 – CaAl2Si2O8) lapis lazuli, known since 6 000BC. Stone 3: Chalcedony (SiO2) named after Chalcedon in Asia Minor is a stone that is sky blue with clouds. Stone 4: Emerald is a beryl (Be3Al2(SiO3)6) with chrome impurities giving it the green colouration. Stone 5: Sardonyx or red onyx (SiO2) or yahalom in Hebrew is the colour of the flesh under the finger nails and blood. Stone 6: Sard is the red part of sardonyx and is what is commonly called charnelian (SiO2). Stone 7: Chrysolite or chrysolithos in Greek meant yellow stone and is likely to have been golden topaz (Al2SiO4(F,OH)2) rather than the olivine referred to today. Stone 8: Beryl (Be3Al2(SiO3)6) from the Greek means ‘precious blue-green colour of the sea’ or aquamarine beryl. Stone 10: Chrysoprase (SiO2) literally means golden leek and is a type of chalcedony with the colour being produced by nickel in the silica structure. Stone 11: Jacinth is zircon (ZrSiO4). It can vary in colour from yellow through red. The stone most suited to the quality of the 12 stones is deep red with yellow shining through in the light. Stone 12: Amethyst (SiO2) which literally means A – not | methyst – intoxicated, is a violet coloured quartz crystal. Note that SiO2 is crystal quartz and without impurities is clear. Quartz is the most resistant of the common minerals found on the earth surface and therefore one of the most prolific. The mountains of the western and southern Cape consist of sedimentary rock mainly consisting of quartz. ​Rudolf Steiner connected the 12 stones to the Signs of the Zodiac starting with iaspis (jasper) connected with Pisces. The 12 stones then connect to the Signs of the Zodiac in reverse order, i.e. the second stone lapis lazuli is connected with Aquarius. This reverse connection to the Signs of the Zodiac is the same order of the precession of the equinoxes. The earth axis has a circular ‘wobble’ which results in the rising sun on the day of the vernal (March) equinox moving in relation to the Sign of the Zodiac. It takes 25 800 years for the sun to rise in the same place. This means that every 2 150 years the rising sun on the day of the vernal equinox moves into a different Sign of the Zodiac. We are currently moving from the age of Pisces into the age of Aquarius. ​Stone 1: Jasper connected with: Pisces, which for the Ancient Greeks were the ichthyocentaurs (man-horse-fish), Aphros and Bythos, who pull the shell on which Aphrodite is birthed out of the sea. This act of ‘midwifing’ Aphrodite into being is one of utter selflessness and for this Zeus cast them into the heavens to shine forever. The two ichthyocentaurs also represent the depths (Bythos) expressed on the surface (Aphros = sea foam). ​Stone 2: Lapis lazuli is connected with: Aquarius, whose image as a water-bearing man comes from the Sumerian god who bore living water within himself and through whom the living water flowed. He is represented as standing with his hands raised and the water entering him through his left palm and leaving him through his right palm. Stone 3: Chalcedony is connected with: Capricorn the goat-fish who is Enki the Sumerian god of wisdom and water. He is connected with crafts – bringing things into being – and magicians. He is credited with the creation of our outer and inner ear – hearing and balance. Chalcedony entered the earth in Lemurian times as an etheric substance into the protein-based atmosphere of the time. In this form it bore the structure of maternal quality of giving birth which brings it into a relationship with Enki. Stone 4: Emerald is connected with: Sagittarius who for the Ancient Greeks is Chiron/Kheiron the brother of Aphros and Bythos. He is the hunter who gets his arrow where it needs to go, connected to focus. In the heavens the arrow of Sagittarius points to the heart of Scorpio. Stone 5: Sardonyx is connected with: Scorpio which is represented by both scorpion and eagle. The flesh in the sardonyx is earthly and the blood is heavenly. It is a stone connected with two realities: heaven and earth. Stone 6: Sard is connected with: Libra the only non-animate Sign of the Zodiac; the Scales of Justice held by Themis the goddess of ‘good council’ or literally ‘divine law’ personifying the divine or natural order or right custom. This sign has a powerful Michaelic association – as many images show Michael holding the scales. The red colour of sard is due to the impurity of iron oxide. Iron is the meteoric metal associates with the Archangel Michael’s sword. Stone 7: Golden topaz (called chrysolite int the Bible) is connected with: Virgo and Persephone, the daughter of Demeter, responsible for the sprouting in spring. Golden topaz being devoid of iron represents a pure uprightness stemming from a spiritual quality rather than through the uprightness endowed through the blood. Stone 8: Aquamarine beryl is connected with Leo. Stone 9: Peridot olivine (called topaz in the Bible) is connected with: Cancer and the transformative quality Cancer represents in the movement of the symbol of the in and the out. Stone 10: Chrysoprase is connected with: Gemini the half twin brothers of whom Castor had a mortal father and Pollux an immortal father. When Castor is killed Pollux asks Zeus, his father, to share his immortality with his twin and Zeus casts them into the heavens. There is a power of wanting to stay together represented. Stone 11: Jacinth is connected with: Taurus or Gugalanna in Sumerian, the Great Bull of Heaven, who is sent to take retribution on Gilgamesh and his companion Enkidu but they slay the bull and dismember it. Taurus is connected with our ability to speak, to express ourselves. Stone 12: Amethyst is connected with Aries. Aries is connected with the “V” sound in Eurythmy and the “V” sound is the sound of pre-birth according to Rudolf Steiner. The Soul Processes that Rudolf Steiner indicates are our task to strive for on earth. The transformation of these Soul Processes into the Spiritual Virtues that are the Foundation of the New Jerusalem are a gift from the Spiritual World. The Soul Processes were developed by the Theosophists and were seen as an end in themselves. Rudolf Steiner pointed out to the Theosophists that these Soul Processes worked on by the whole of humanity will be transformed into the Spiritual Virtues that will be received as a gift by humanity at the beginning of the next great time cycle after the time cycle of Earth is completed. Stone 1: The Soul Process connected with Jasper is magnanimity or generous forgiveness. This is a Soul Process that requires us to work in the social realm. It is a quality that we associate with kings of old. To be magnanimous we must give up our sense of self-righteousness, there is a sacrifice connected with magnanimity. The connection to the blood-stone of Jasper lies in the significance that the Hebrews placed on blood. Adam (Adama) literally means the ability to show blood, i.e. to bleed or to blush. The correct translation of the text in Genesis 1 of the Elohim saying “let us create Man in our image” is “let us cast a shadow in which blood can appear”. We see in the virtue a connection to Aphrodite and Pisces and we can understand how a sacrifice in the blood – in the human state – can bring about the virtue of Love. Stone 2: The Soul Process connected with lapis lazuli is Discretion, the ability to be able freely to decide. This Soul Process requires freedom to exercise, the human freedom that has come about through our “I”. I have the discretion to leave my mark on the world. The Hebrew word connected with saphir (from which we get the Greek for blue stone) is to make a mark, which lapis lazuli is used for. The death mask of Tutankhamun is coloured blue using a paste of lapis lazuli. The Sumerian god connected with Aquarius exercised his discretion to turn water into living water. The power referred to is the ability to carry, sustain or hold. It is not might or force. The exercise of our free choice in discretion becomes meditative power. It also means that in our human practice of meditation (before it is a Spiritual Virtue) we should exercise discretion. Stone 3: The Soul Process connected with chalcedony is Courage or a strong, free-filled selfhood. This relates to taking hold of ourselves each morning after sleep. The redemptive power of Christ gives us the power of freedom to be. The redemptive power of the Spiritual Virtue is connected with a power of recovery, of saving and is a power that frees us in order to progress. Stone 4: The Soul Process connected with emerald is Control of our Thought. Rudolf Steiner described the colour of the emerald as a moral quality. Our evolution has provided us with logical, sequential thinking. The works of Euclid are complete, nothing has been added, in terms of added logic, since Euclid. In Euclidian Geometry we understand everything of logic but when we take geometry into Projective Geometry we require a different thinking. This thinking is still rudimentary in the human being and that is heart thinking. When we understand something we have experienced we exercise heart thinking: it is no longer just sequential and logical. Stone 5: The Soul Process connected with sardonyx is Patience: to wrestle with the urgency I feel. A good example may be pregnancy which we know is going to result in birth but requires patience for the time to be fulfilled. There is something in both the uterus and the larynx related to patience. Original Sin may be regarded as a lack of Patience. Our destiny was to eat of the fruit of the Tree of Knowledge of Good and Not-good (the correct translation of what is translated as ‘Evil’) but we lacked patience and ate of it too soon. Discernment is human insight impregnated by the spirit. Stone 6: The Soul Process connected with sard (carnelian) is Contentment: a state of feeling fulfilled. It is also being able to live with the judgement as it relates to Libra. Composure as in being self-possessed or in self control, being serene and tranquil. Stone 7: The Soul Process connected with golden topaz (called chrysolite in the Bible) is Courtesy. We need to free ourselves of our ego-sense – as in the stone that is free of iron – and refine our soul to be considerate. We need to develop a virgin heart, a pure heart and in this lies the relationship to Virgo. Stone 8: The Soul Process connected with beryl is Compassion, the ability to feel with someone else through warmth and love. Compassion does not ask us to change the condition of the other person, but to feel their suffering with them. Beryl formed in the earth at the same time as the human sense of thought was developing. Rudolf Steiner indicates that in our time we can grasp the spirit through our thinking. This development in how we grasp the spirit from our will to our feeling and now to our thinking is connected with our development towards freedom. Stone 9: The Soul Process connected with peridot (magnesium-olivine) (called topaz in the Bible) is Unselfishness. Catharsis is a purified piety, a process of letting go, a release or a relief. Stone 10: The Soul Process connected with chrysoprase is Perseverance. Perseverance relates to the qualities of resolve, tenacity and persistence as in the perseverance of Castor and Pollux to be together. Chrysoprase is cryptocrystalline which means made of tiny crystals that require perseverance to hold together. Stone 11: The Soul Process connected with jacinth is Equilibrium, a calm state of holding in balance as jacinth holds the yellow within the red. It is a spiritual gift that our future is constantly progressing. Stone 12: The Soul Process connected with amethyst is Devotion. In living a life without intoxication we develop devotion. Rudolf Steiner tells us that the first of the Soul Processes we need to work on is Devotion. In working with the Soul Processes we start at the 12th stone and work in reverse order. By working on the Soul Processes we can hope for their transformation into Spiritual Virtues and these Spiritual Virtues form the Foundation Stones of the Heavenly Jerusalem. In this Earth age of our evolution we have developed the Ego, the sense of I. With our Ego we work on our Astral Body, our feeling body to transform it into Spirit Self. The development of Spirit Self is the great task of the next age of evolution, the Jupiter age. The Heavenly Jerusalem is the seed of the unfolding of this next age. The Heavenly Jerusalem is a cube with the same length on all its sides and this length is the measure of an angel and the measure of a human. The Heavenly Jerusalem is the measure of our unfolding. Once the Ego or I has transformed the Astral body into Spirit Self it will begin to transform the Etheric Body and finally the Physical Body. Once this transformation is complete the task of the I will have been completed and it will have given itself or sacrificed itself into the Spirit Self, Life Spirit and Spirit Man. This Virtue of Sacrifice we develop in this age of the Earth through Devotion. These are qualities that are known to the Nine Hierarchies, but never yet experienced because they can only be developed in freedom: the gift bestowed on Man, the future 10th Hierarchy. The City of the New Jerusalem is a city filled with people which means that we are not working alone, or responsible alone for the Soul Processes, we develop these in community. This is the third successive year in which we have set aside the 12 Holy Days to work on an aspect of the 12-foldness of the Virtues, the Zodiac, the Foundation of the New Jerusalem. Fifty-one years ago this Christmas season I had been studying at the Hebrew University in Jerusalem for about six months already. Jerusalem was still a divided city. My Hebrew was good enough to get along on a day to day basis, but still far from adequate for studying at the university. December had rolled around. We had celebrated a lively Chanukah that year and soon we would be having a few days off for the end of term and exams. The weather had turned a bit colder, still no snow, but cold enough to warrant a jacket or even sweater in the evenings. Now, before continuing with the story, you must know that the three most important “secular” holidays in the United States were then and still are Independence Day in July, Thanksgiving in November and Christmas day. Everyone is in the Christmas “spirit” well before December comes around. Everywhere there was canned “musak”, and “musak” was pretty much everywhere back then, not just in stores themselves, but in elevators, malls, most public buildings, even in some outdoor venues. Christmas carols could be heard non-stop. Growing up in a Jewish family in Dallas, Texas, it was difficult not to get enthusiastic about the coming holiday season. All the decorations, the Santa Clauses, the gift buying, the rushing around, the announcing of winter’s approach. There were enough fond memories of the season to become nostalgic about so that by December 24, 1966 several of us went in search of some place to hear and sing along with carols. So a group of friends ended up at the “Yimka”, that was the YMCA in Hebrew, for an evening song fest that ended about 10 pm. As we left the Yimka someone had the bright idea of going on to a midnight mass at a near-by catholic church. So there we were up in a balcony, looking down on the, for us strange, proceedings far below at a Christian altar attended only by monks and priests. At one point in a sermon, probably delivered in English, the priest said in a joking manner, how fortunate it was that Jews in Jerusalem entered into a house of worship at least twice a year, once for Yom Kippur, the Day of Atonement, and once for Christmas Eve midnight mass! And, indeed, the balconies were full of curious on-lookers. At the end of the mass, we were all instructed to “Go in peace.” Which we wholeheartedly wanted to do. We left the church and instead of returning directly to our dorm rooms at the university, we walked to the nearby boarder which stretched through Jerusalem and between Israel and Jordan at that point. There was an enormous sign warning us in Hebrew, in Arabic and as if that weren’t enough, also in English: “G’vul, Assur L’avor”, “Boarder, Forbidden to Cross”. Then for good measure, I suppose, there was a note below the warning that read “No Man’s Land”. We stood there a while in the cool night air, looking up at the clear sky with its cloudless and glorious star display. Off in the distant valley below, we could see a few lights of a then small city-village. 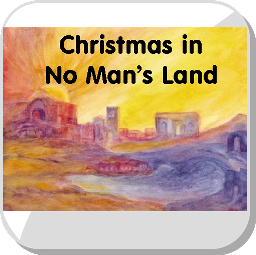 When we realized that we were looking down on Bethlehem, we disobediently crossed over the imaginary line and passed the warning sign and sat down on the ground. There we were four American Jews, studying in Israel, sitting in No Man’s Land, looking down at an Arab village, to the very place where so many years before the Christian miracle of the birth of Jesus had taken place. I can still remember the strange mixed feelings of that special night and the sense that something was being sown in my soul. It would take quite a few years, but those seeds were hearty and finally sprouted and have begun to bear fruit, so it seems. But I don’t mean just the fact that I met, so many years later, Anthroposophy and the Christian Community and then was ordained as a priest in the Community, but also the fact that lives as a reality in my soul still today, having had the privilege to visit many different Communities in many different countries and languages, that in spite of the current political situation, I know that the Earth, all of it, every speck of it, sea, field, desert, mountain, valley, river, village and city are really in No Man’s Land. For the Earth, no part of it, no matter what laws may say to the contrary or what ownership papers we may possess, the Earth, all of it, belongs to no human being. The Earth has always and will always belong to the Gods. It has only been entrusted to us humans for a time, to be responsible for, to nurture and to care for as stewards of a godly work. It has become increasingly incumbent upon us to contemplate and grasp what it is that the Gods themselves have in mind for the Earth’s course in time and then to try as best we can, better really than we can, to help them move the Earth along toward its manifest divine destiny. We must be very grateful for Science. It has taught human souls to be objective. We have learnt to be factual, accurate, to reduce things to measurements and quantities, and to remove emotion from our observations and conclusions. Then, we could bless too that in us which managed to survive our several hundred years of dedication to the Sciences – our understanding of the material world, the mineral world. What is it that I refer to that has survived? Is it really discernible with our modern everyday faculties? Of course I believe that it is and wish to take you on a little path, that you have most likely trodden previously, that will remind you of your surviving seed of humanity that is in addition to your cognitive competence. Let’s define nature and keep it very basic so that the distinction is easier to grasp. We will need to keep our thoughts of nature and our humanity a little separated before we try to bring them closer together. Nature is all that continues, even rules, when men and women (together mankind) are not present. Run through this with your active thinking. Imagine a world where mankind is absent, or even a piece of this world where mankind has not intervened. Then, having thought this through, move on by taking a deserted town into your thinking, like the one near Luderitz (Kolmanskop) in Namibia, and see the effects of nature on it once mankind has left the area. Nature takes over again. (Having said this, it draws us, however, to the realisation that something happened to nature when mankind first approached the area.) Moving on and leaving this for the moment, let’s ask the question ‘what part of mankind is nature and what part of us is possibly more than nature?’ Well, mankind is nature to the extent that we cannot avoid what we are physically. We are a species. We have a body that needs to feed, procreate and survive physically. We need to digest, breathe and operate at a certain temperature. We are warm blooded like other mammals. We have physical senses like other animals. We can hear, smell, touch, taste and see. In all these we are part of nature. Our humanity shows itself to us just in being able to write this piece. But, let’s start from the beginning. I can decide what I want to eat, when I want to procreate, whether I want to prioritise one sense impression over another. An animal cannot do any of these out of its own. It may appear to be ‘thinking’ or ‘deciding’ when it has been taught not to eat, but really it is obeying a stronger sympathy or antipathy than the desire to eat when it is not eating, but desires to eat. It cannot decide on its own not to eat. In these very observations that I have made, I am using the basic disciplines that mankind has learnt in his discovering of the physical Sciences. I am just adding to these learnt capacities a quality of being very open, not only to the material realities of existence, but to the softer more delicate and hidden realities of our humanity. I see that when mankind inhabits a physical space within nature, nature retreats or withdraws. Darkness also withdraws when I light a candle in the dark. The moment the candle strengthens or weakens, the darkness can do nothing but respond. The same applies to ourselves. We can be totally nature when we withdraw our consciousness, our will, our thinking, our desire to understand who we in fact are. We can, on the humanity side, bring the free acts and qualities of love, of patience, clarity, courage, and more. These lead to us filling the space we occupy in nature with different external consequences, even if viewed only from a social sense. Within the cosmos, and the majestic power of nature that holds it mysteriously together, we find the Earth made up of the mineral, the plant, the animal, the ‘animal man’ together with the drop of humanity within us that is something more than nature. The animal man and the drop of extra is what we are. This drop is nowhere present in animals. It is what we have as a freedom. It is new to us. We need to test it and see whence it comes and what it can achieve. Whether I am a Jew, a Christian, a Muslim, a Buddhist or other, the sciences remain the same, but, different things weave their way into earthly nature around these various inner approaches taken by the different religions. This is a clear indication of our humanity working into the world because of an intangible that we hold within ourselves that is not possible with animals. All these religions recognise nature as something that is separate from mankind’s humanity. All are recognising that there is a seed of something Godly in us. Perhaps the future is to try to be conscious of our humanity and the space that we choose that it fills that would otherwise be filled by nature – or – the light that we allow to shine in the darkness. Where there is light there is the possibility of orientation. Our individual human light can shine for others as we become conscious of our own humanity and work with it. Only understanding the mineral world with Science leaves us short of this possibility.